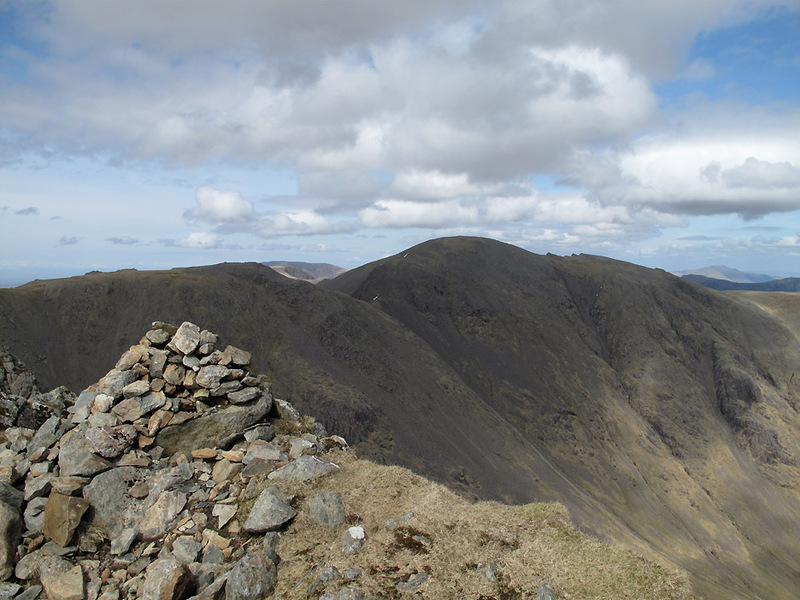 " Red Pike and Pillar "
Date & start time: Saturday 20th April 2013, 11.15 am start. 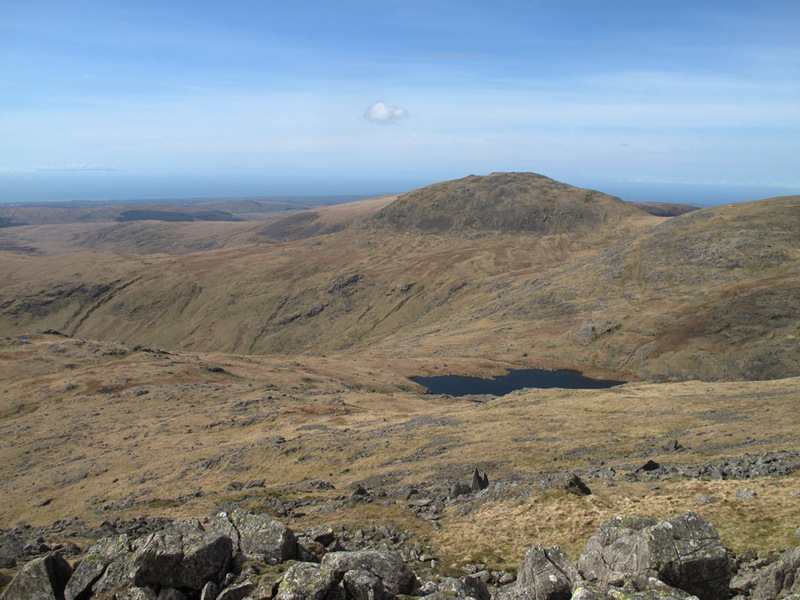 Walk details : 9.6 mls, 3700 ft of ascent, 7 hours 30 mins. Weather : Superb ... clear air, cool breeze, warm sun and dry all day. 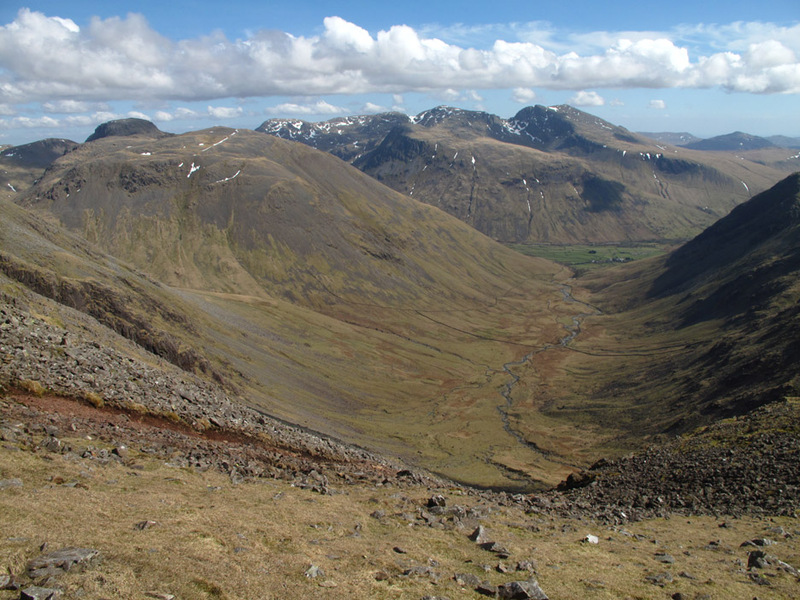 A longer walk to climb two major Lakeland fells in the Wasdale area. 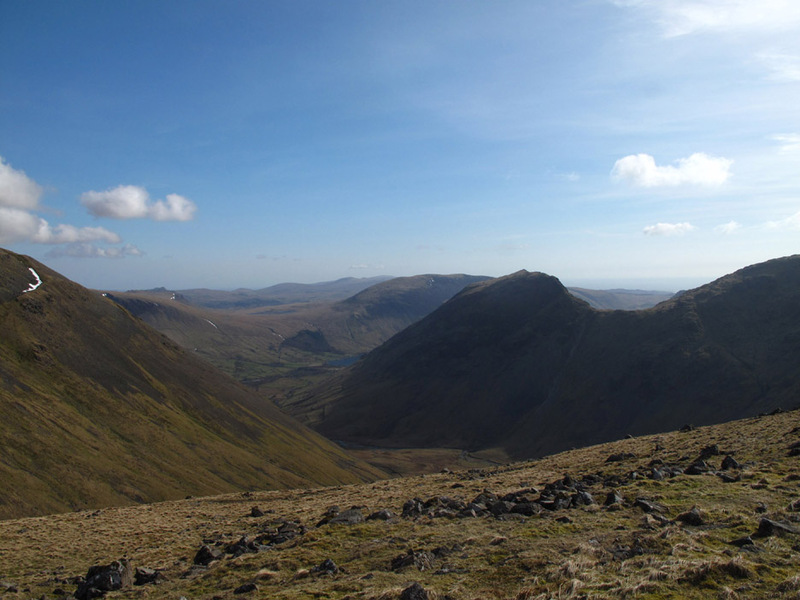 this great walk on the high fells with a relaxed beer in the Wasdale Head as we finished the day. 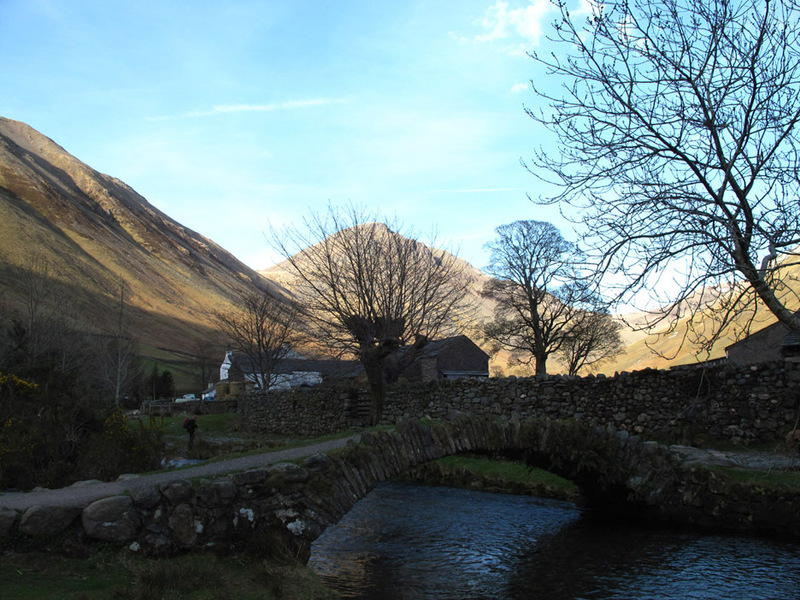 Overbeck Bridge and car park under Yewbarrow. 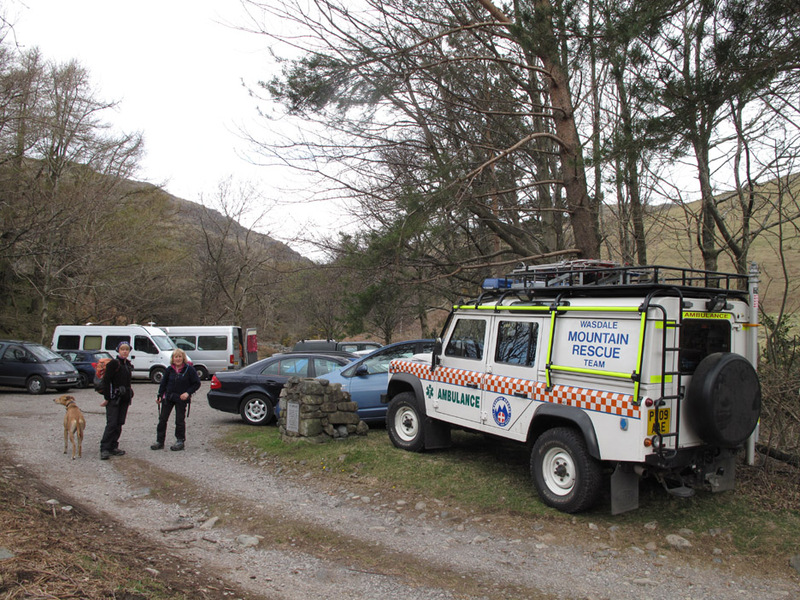 We managed to take the last space in the car park due to various activities going on in the vicinity today. The beach opposite shows signs of the work, now landscaped out of sight, to restore electrical power to the head of the valley. A quick walk over to the lakeside gives you an idea of the weather today. Overcast but dry . . . the prospect is for a good day with improving weather. 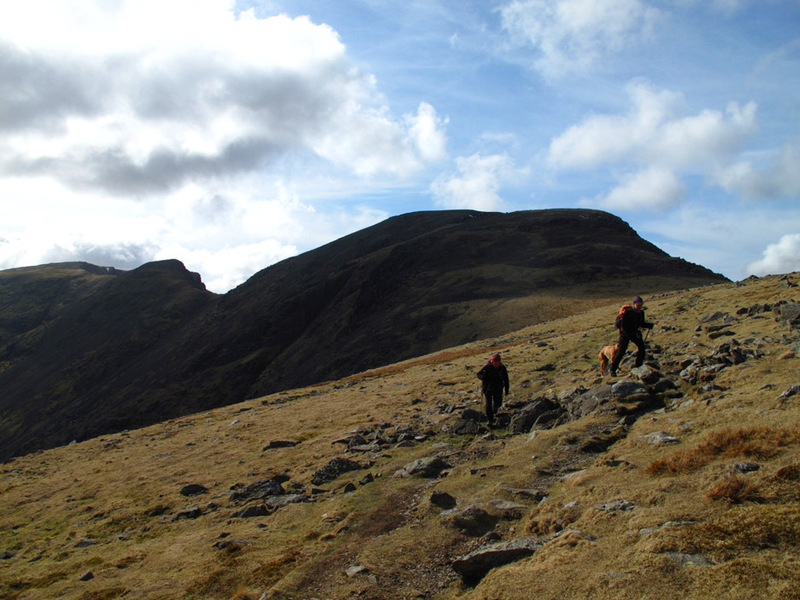 The Wasdale team were out, and have just departed up the hill for a bit of a practice day . . . they've taken a few spaces no doubt. 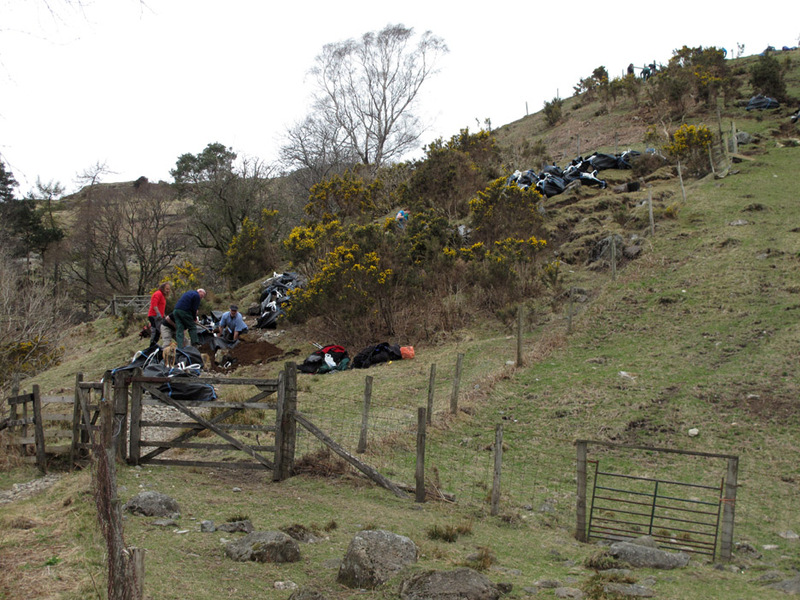 The Path Fairies (Fix the Fells) are out too so that accounts for many of the other cars. 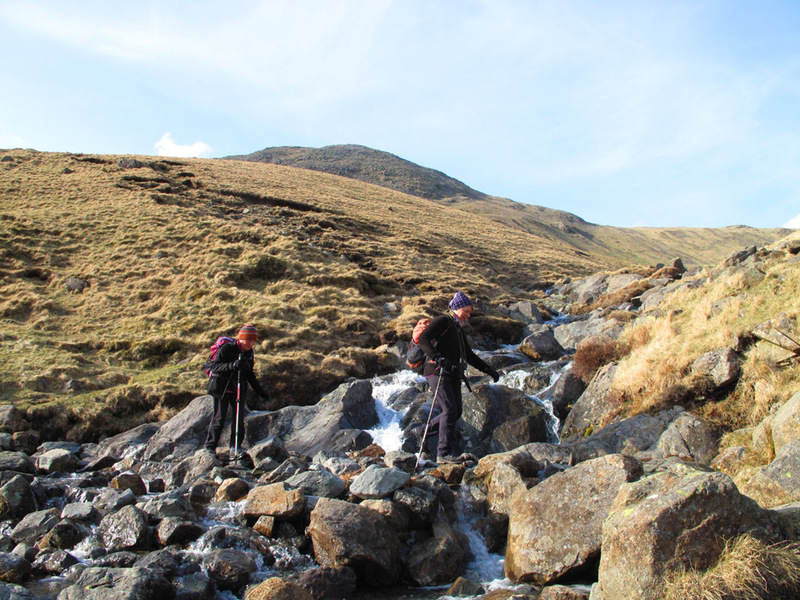 Here they are repairing the start of the path onto Yewbarrow and higher up they have plans for the awkward scree descent from Great Door. 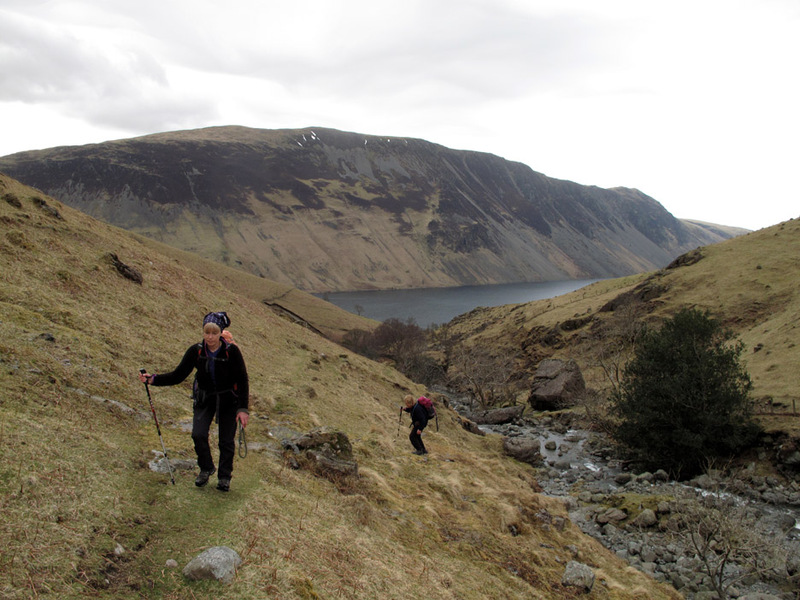 We pass on the direct ascent of Yewbarrow in favour of the route up Overbeck valley. 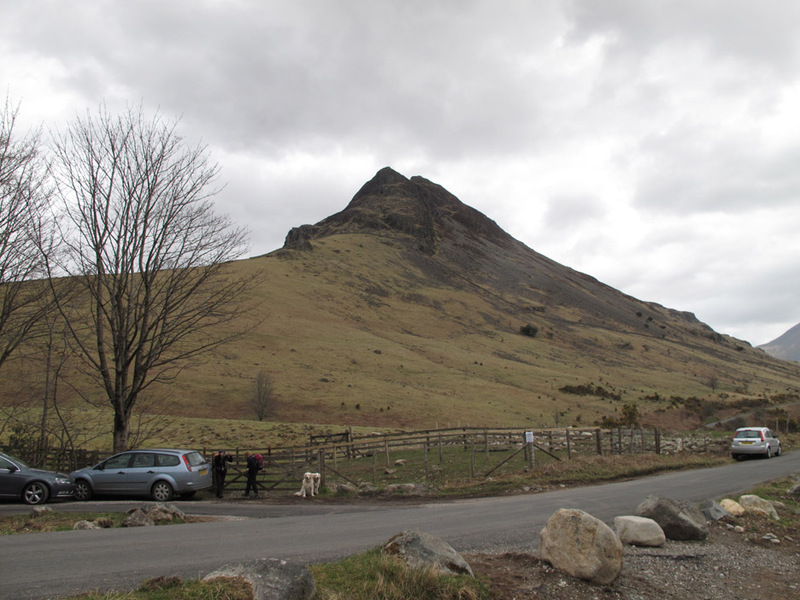 We follow the stream up at tree height but the view of Whin Benn and the Screes dominated the rear view mirror. Above the tree line now as we follow the path up alongside Overbeck. Ann and Jo with two of the four dogs. 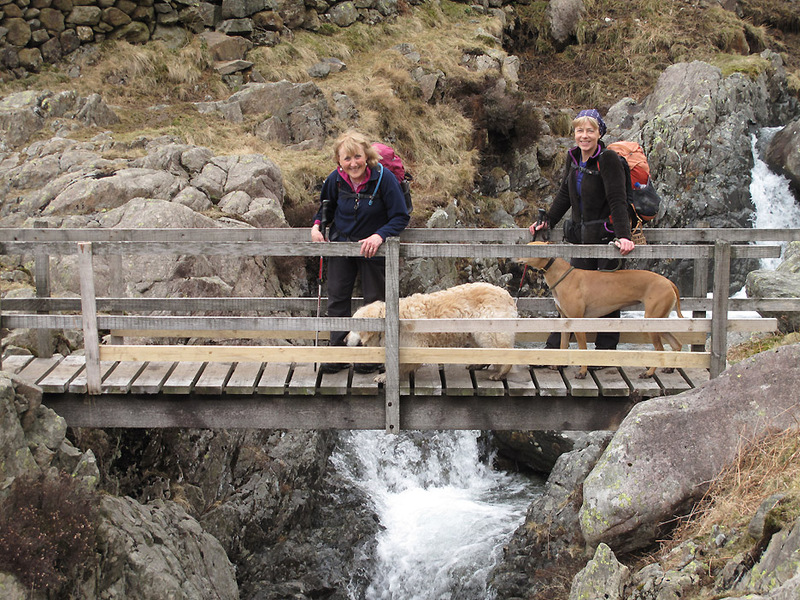 Bethan is already over the bridge and Jodie is relaxing back in Loweswater as it was felt that this walk would be too much for her today. 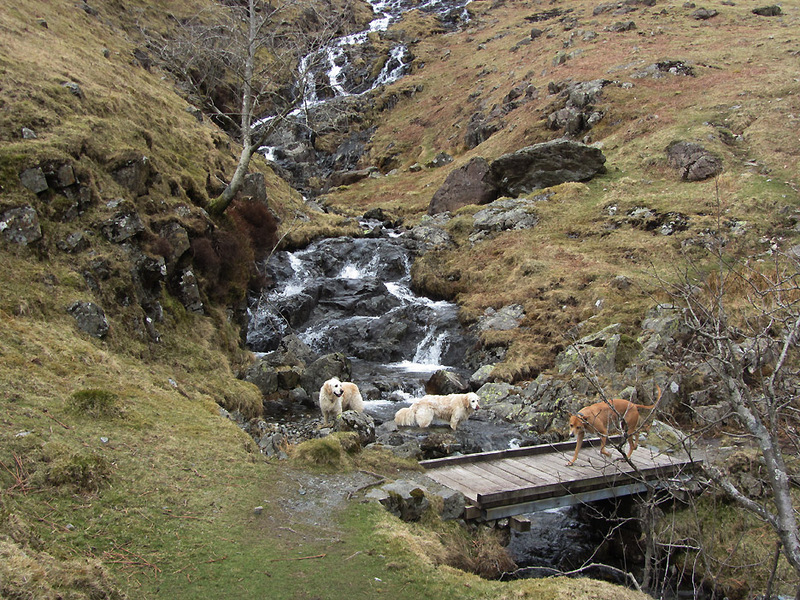 Another bridge, this time over Brimfull Beck. This delightful name is given to the stream that flows out of Low Tarn and cascades down between Knott Ends and High Fell. 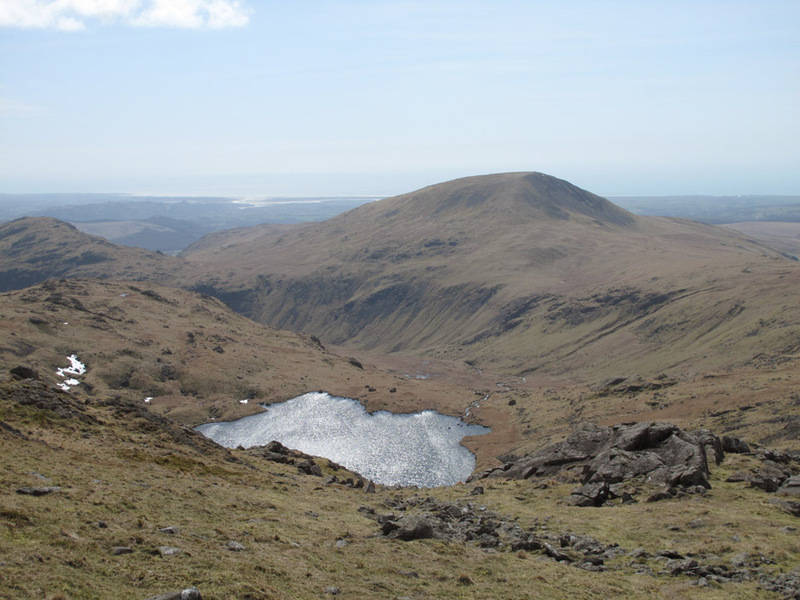 It flows when Low Tarn is full to the brim . . . which in this climate is pretty well all the time ! 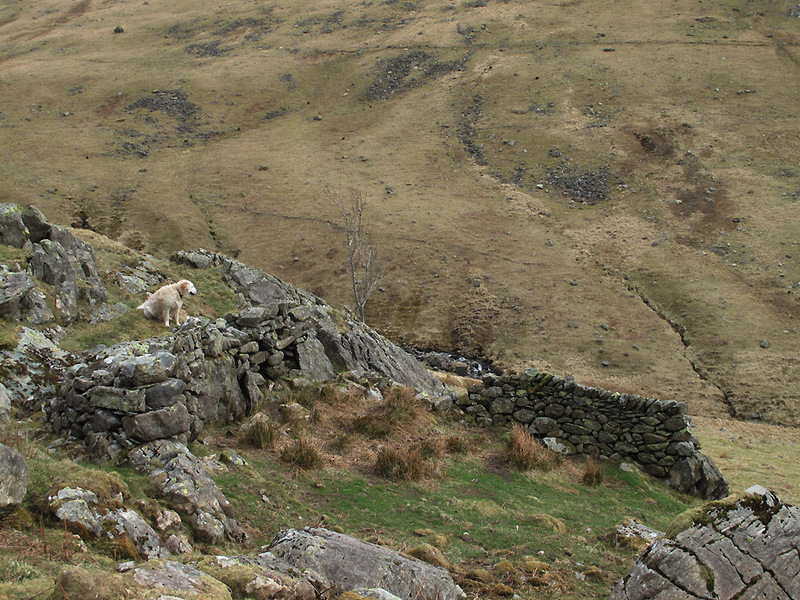 An old sheepfold utilising the natural rock structure that exists alongside the path up towards the head of the valley. Harry and Bethan on one of the larger rocks that have cascaded down the fellside in years past. The top of the valley is the famous Dore Head, but we are taking a more direct route to Red Pike and will bypass it today. 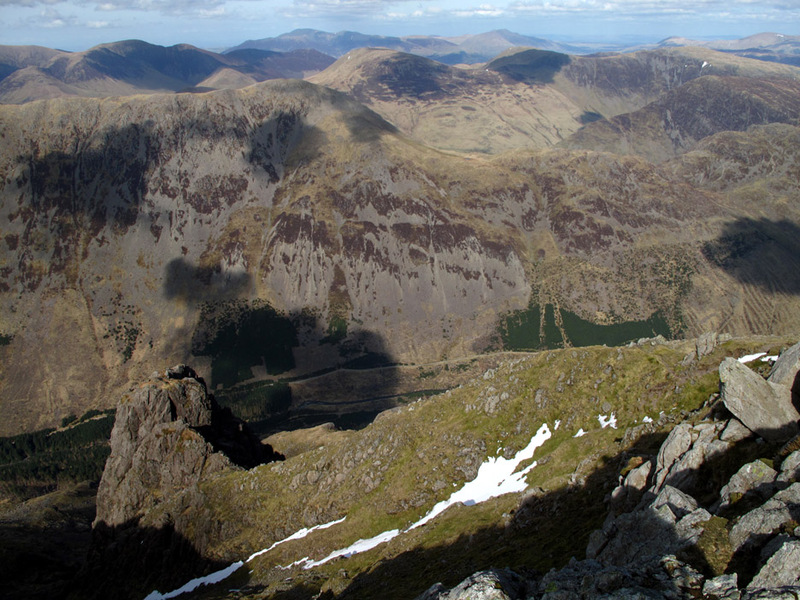 As we climb, the crags of Red Pike and Yewbarrow (Stirrup Crag) frame an ever changing view. 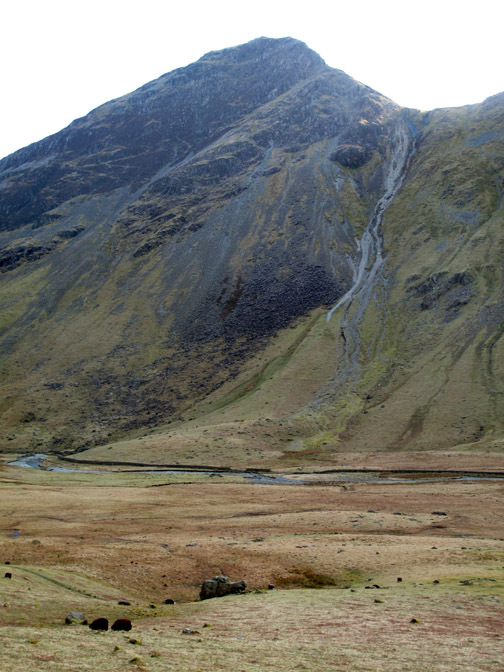 First the bulk of Kirk Fell fills the background. 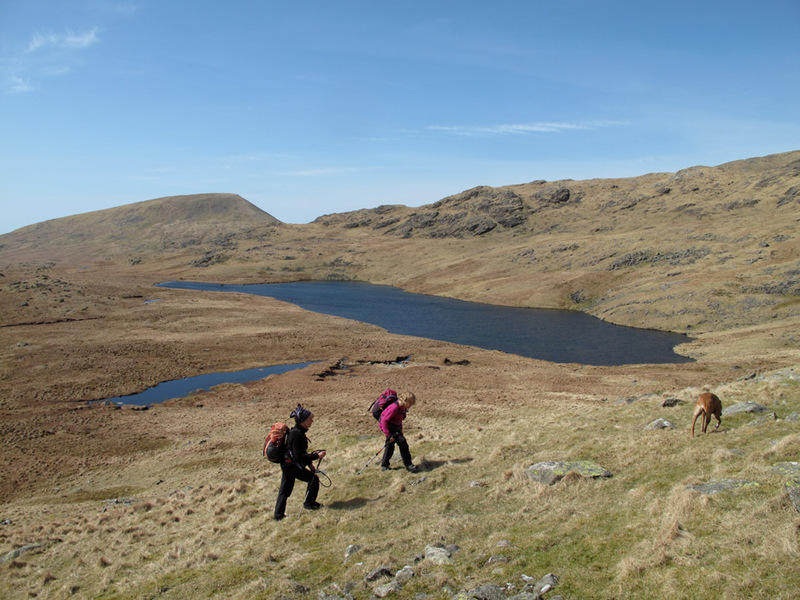 We pass Low Tarn . . . full to the brim as expected. 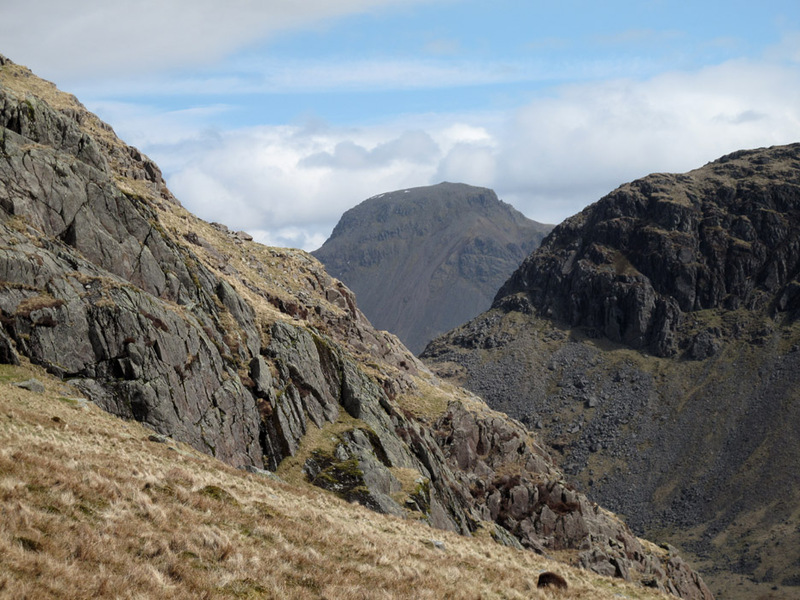 Our landscape now frames the magnificent bulk of Great Gable. 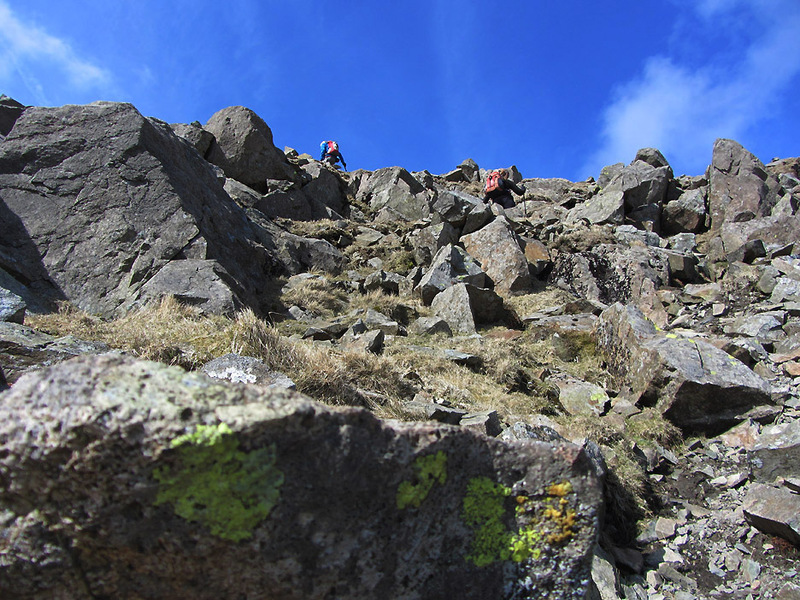 No path up here as we have followed a grassy rake up on a direct ascent of the Pike. 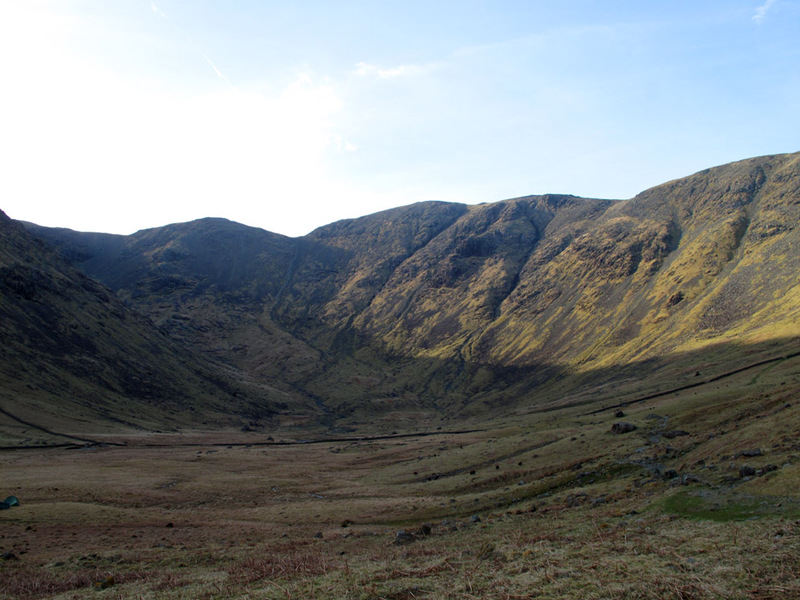 Behind the full extent of the Screes is revealed, with broad Illgill Head on this end and the more pointed Whin Benn on the other. Through another gap Green Crag is highlighted. 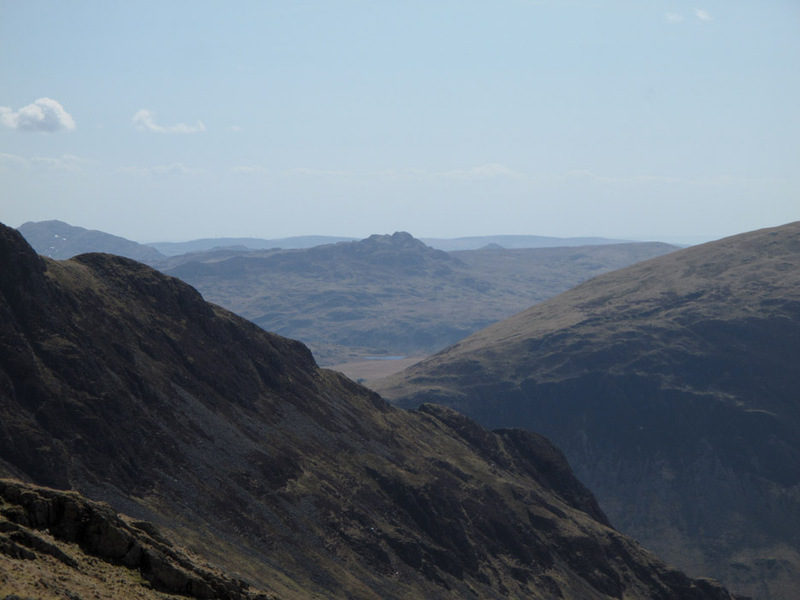 Caw Fell is on the left and just the tip of Stickle Pike can be seen next to Green Crag . . . the water is Eel Tarn I presume. and the lighter sands on the coast at Ravenglass. 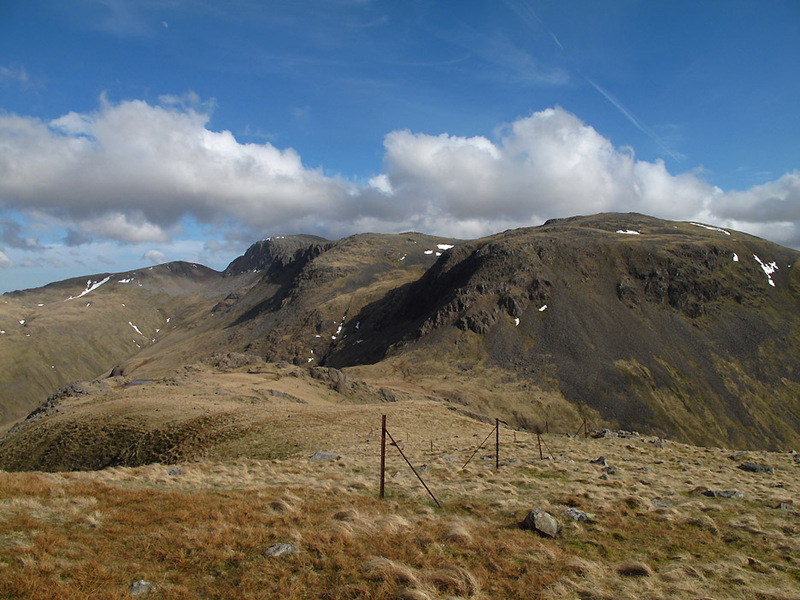 The Scafells, from Great End to Slightside can be seen over the ridge of Yewbarrow, cunningly disguised as part of our immediate fell. Bethan . . . cunningly disguised as Harry . . . or is it really Bethan . . . they are looking more alike as time goes on. Answers on a post card (or email) please. 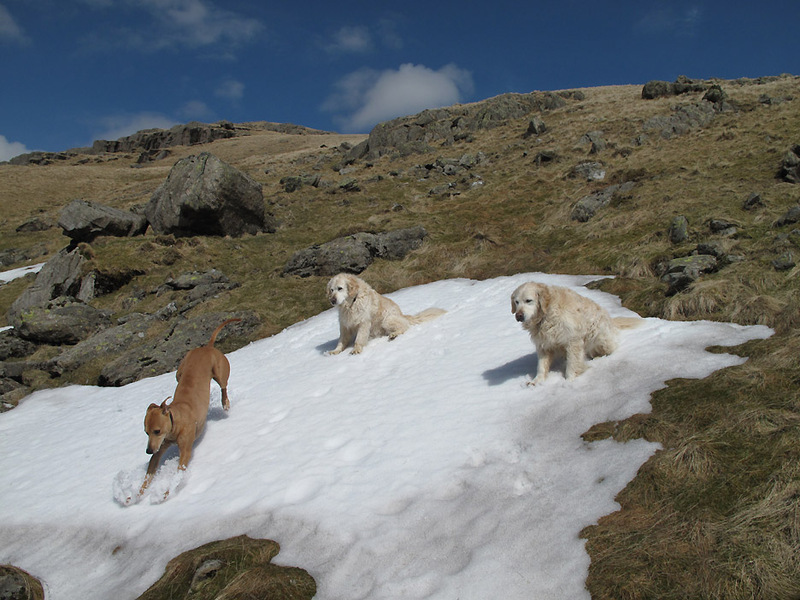 Officially above the snow line and Amber rushes in order to be included in the photo. Easier walking now as we near the top . 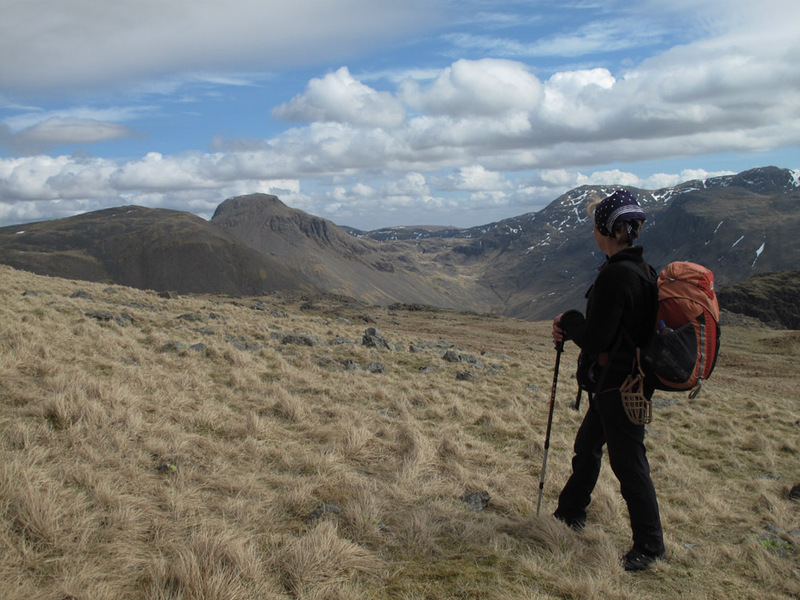 . . Jo looks across at the magnificent shape of Great Gable. 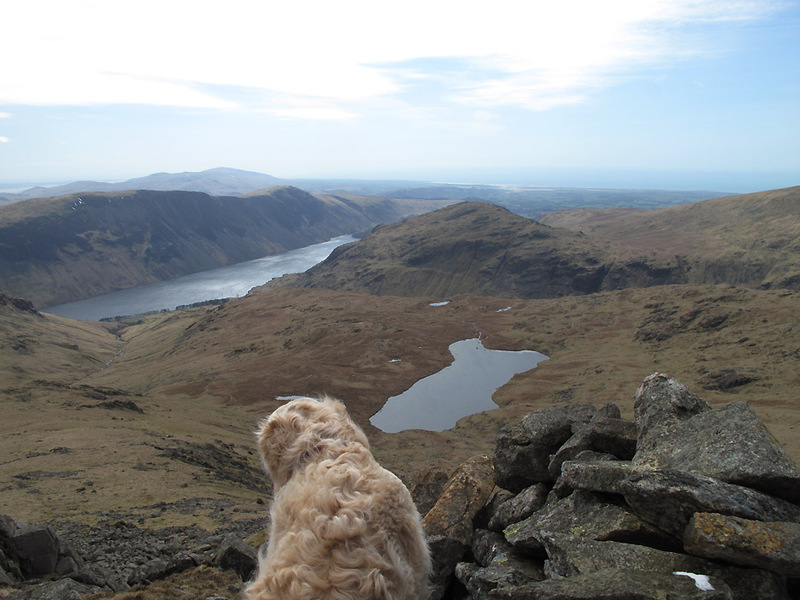 From the ridge we get our first view of Scoat Tarn . . . sheltering under the slopes of Red Pike, Scoat Fell and Haycock. 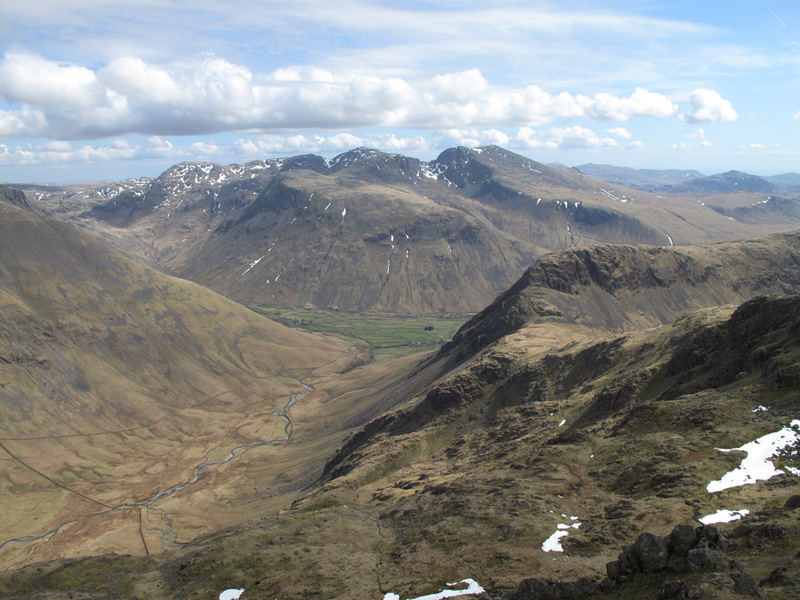 and has lovely views down over the western side of the Lakes, especially on a day like today with such good visibility. 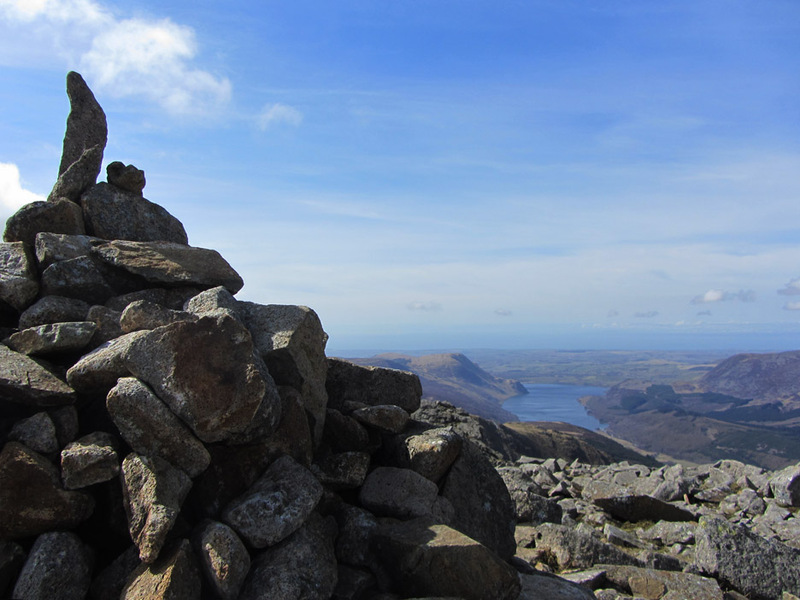 "The Seat" has been constructed as an integral part of the cairn . . . just room for one on the seat it seems. Room for two if you are slim !! 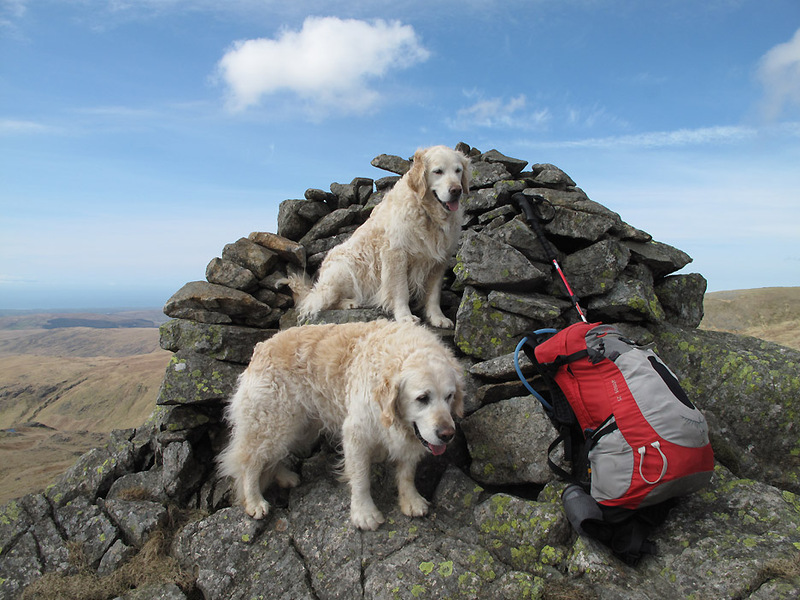 We reached these lofty heights so time for a little lunch as a reward. Where shall we sit that has a nice view . 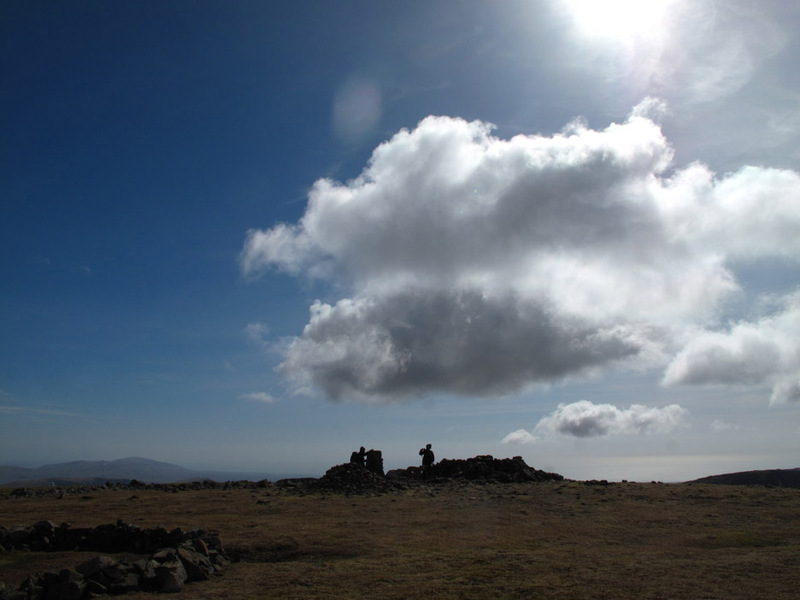 . . the middle cairn of the three seems a good place. 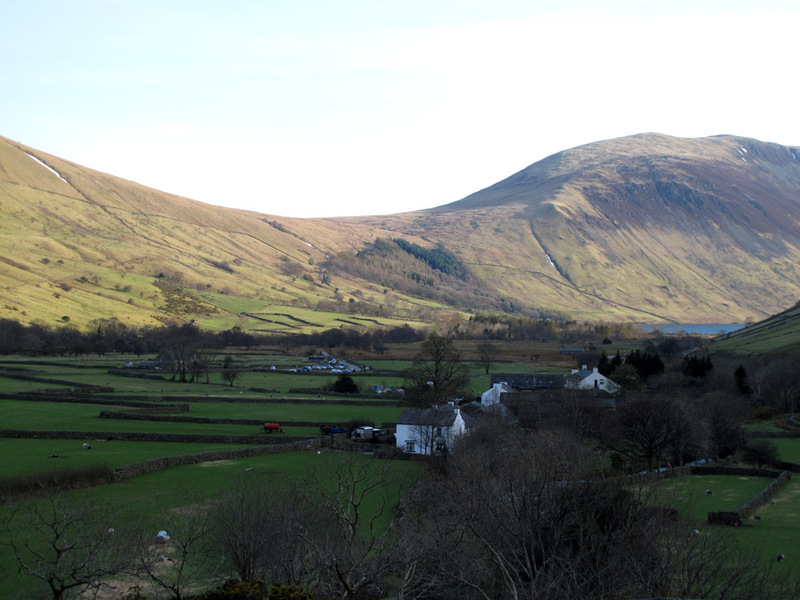 Click here or on the photo above for a Loweswatercam 360 degree annotated panorama taken from our lunch spot. 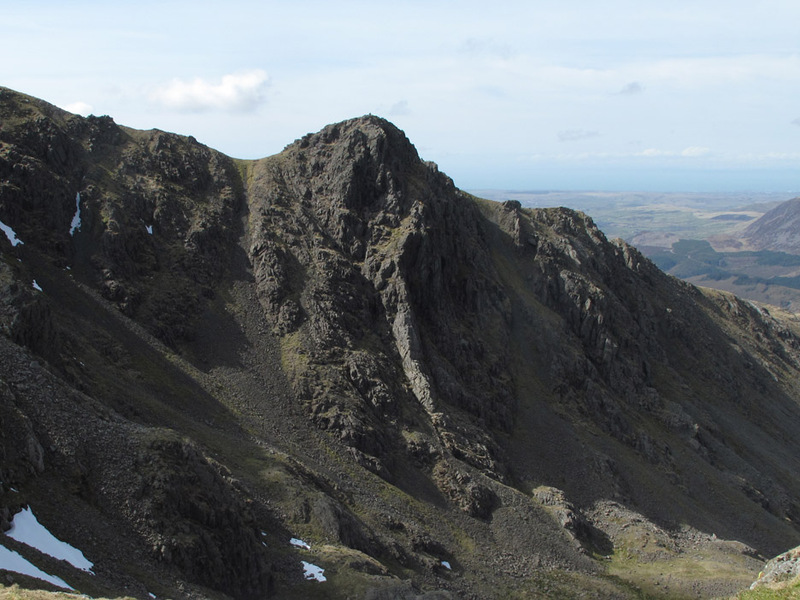 On a short way in time and distance and we are now at the true summit of Red Pike, perched high on the edge of the crags. 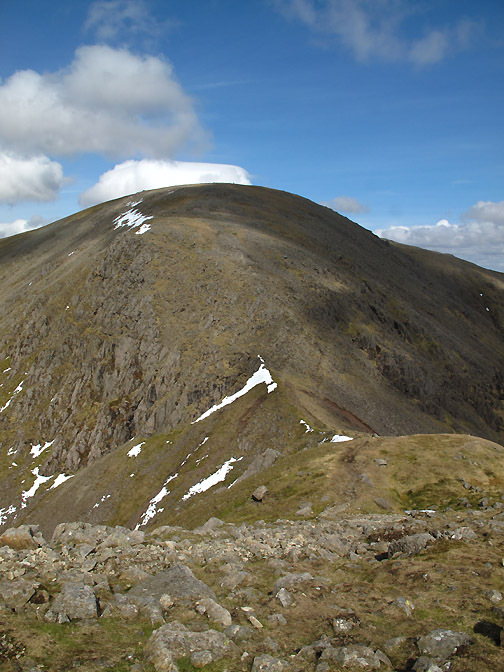 Beyond is Black Crag and Pillar, our second major summit of the day and target for the next part of our walk. Time for a summit photo first. There's a cool breeze up here which encourages the use of gloves and alters the hair style. The Vaporize jacket is working well, albeit with two layers of icebreaker underneath, pity it has to go back sometime. A second photo with Jo is requested so who am I to complain . . . Ann takes the camera of course. 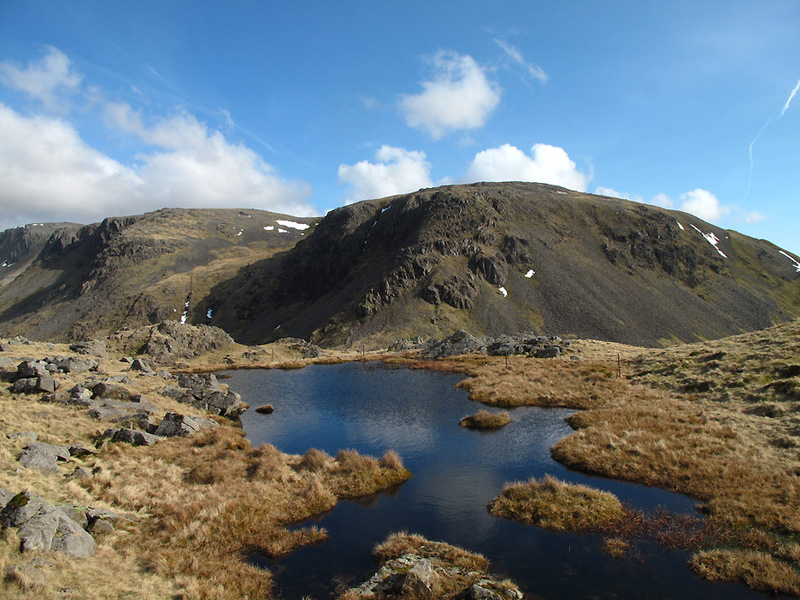 Scoat Tarn and Seatallan . 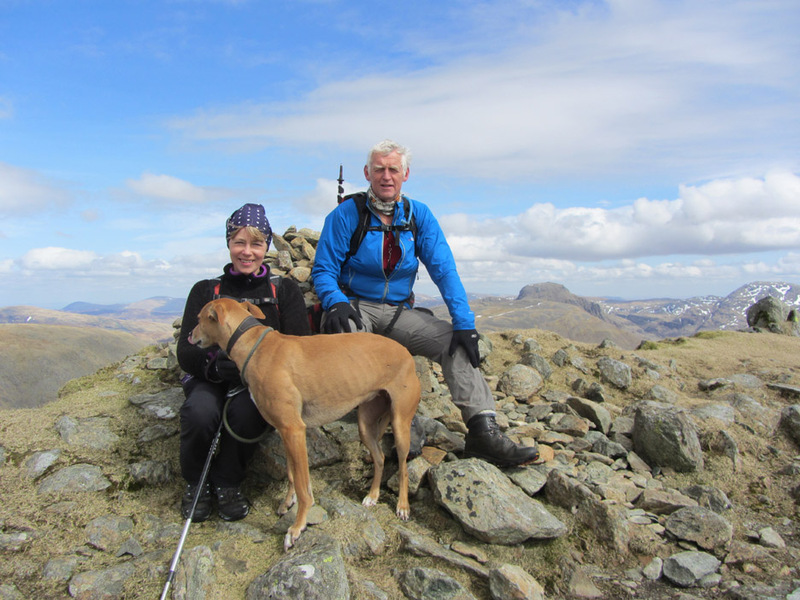 . . taken this time as we left Red Pike summit. 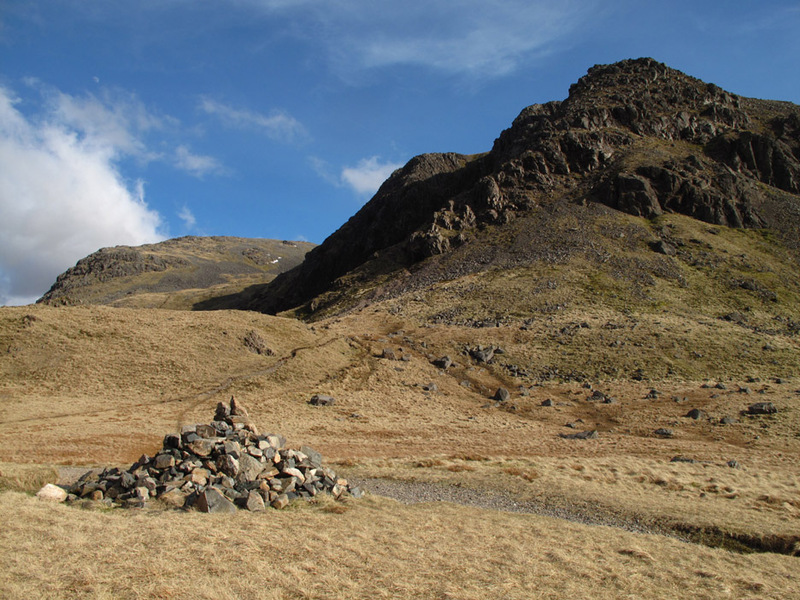 You can see how the Red Pike summit cairn is perched on the edge of the high crags. 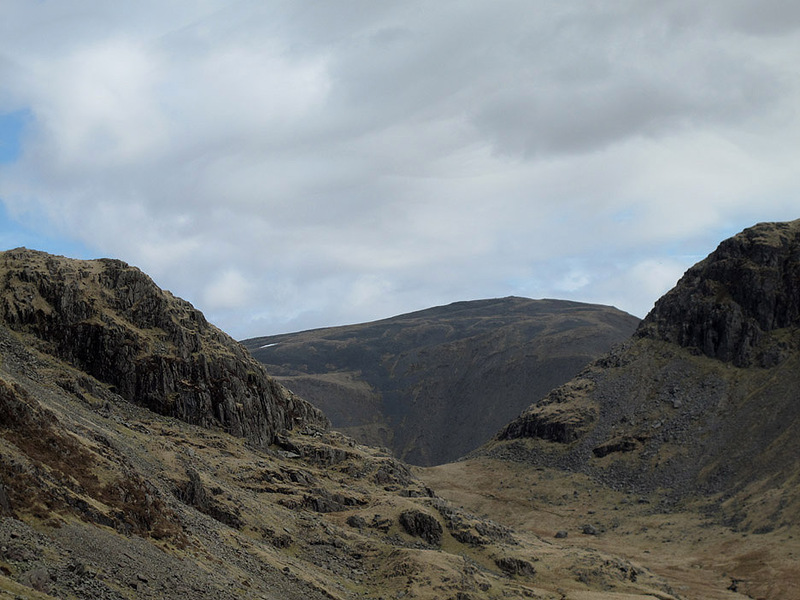 This was the view back as we traversed round under Scoat Fell, heading for our next summit. Fine rock scenery on the way around. The snow cornice on the next ridge stops you in your tracks . 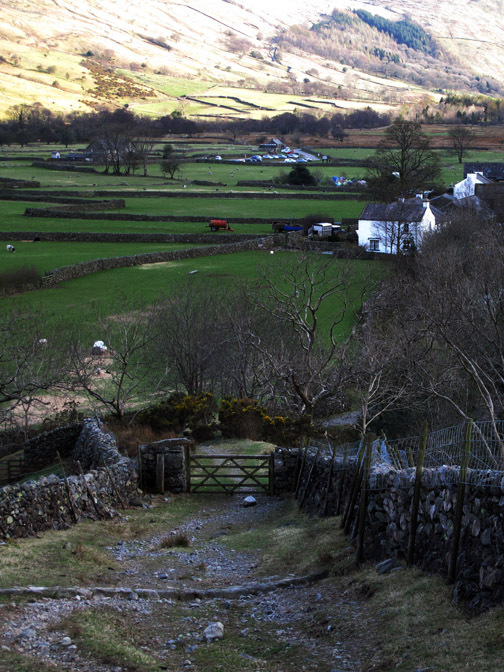 . .
if only to take in the dramatic view of Scoat Fell and Steeple across the way. Zooming in on the bulk of Steeple itself . . . the crags falling away into the darkly named Mirk Cove. Up in the open air again . 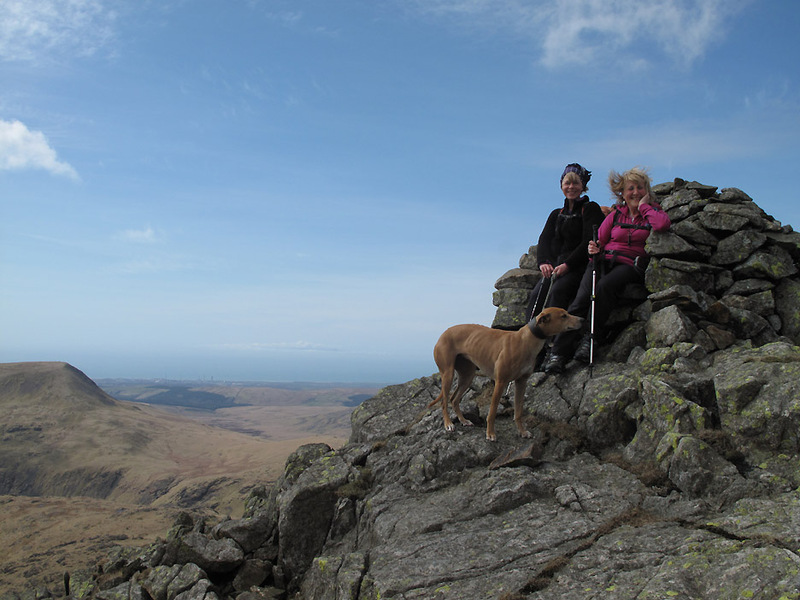 . . on the stoney summit of Black Crag. 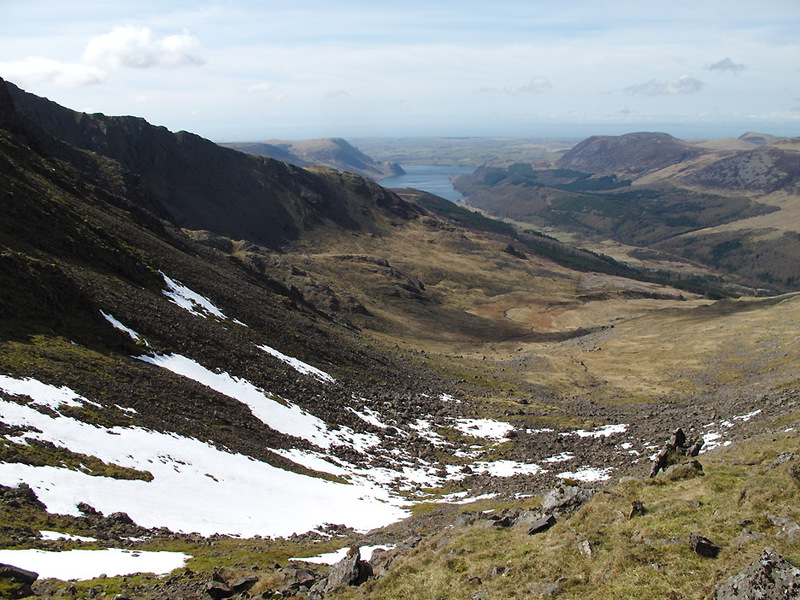 Down below us the Ennerdale Valley is laid out for all to see. 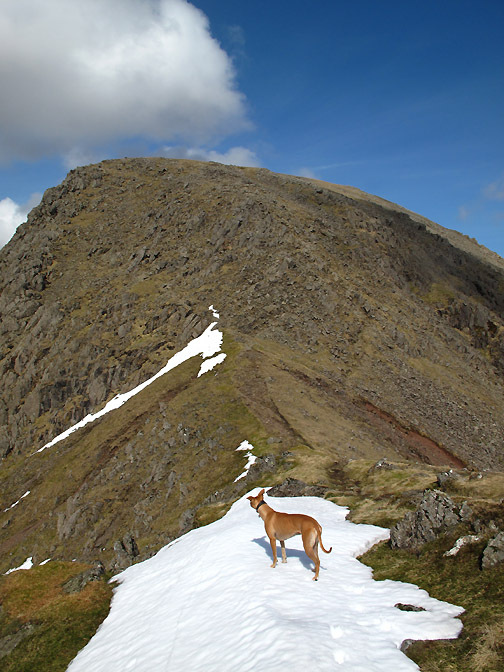 The north west ridge of Pillar ahead is an alternative way up from Ennerdale . . . but not for us today. 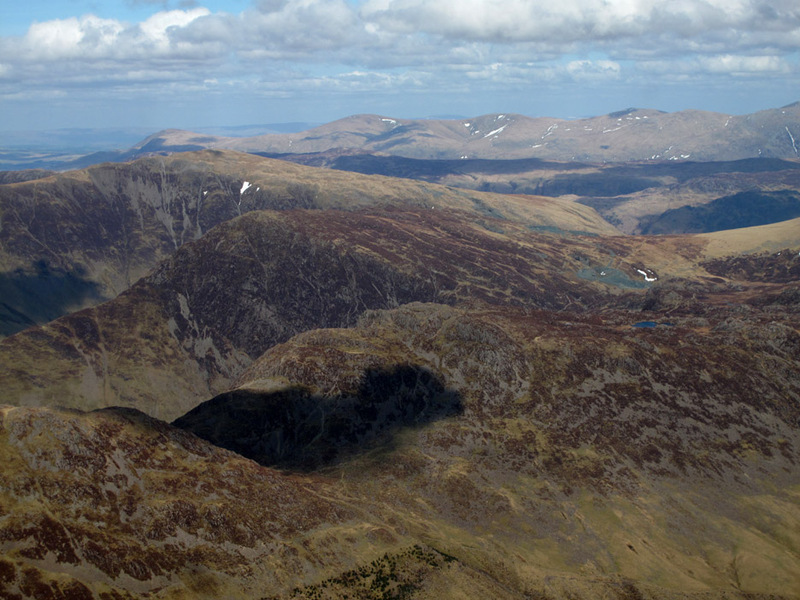 Beyond it is the unusual profile of Buttermere's Red Pike and the High Stile Ridge with Grasmoor and Eel Crag/Sail beyond. The climb to Pillar ahead . . . as we drop down to Wind Gap. The climb looks steeper the closer we got. We watch distance figures ahead taking what seemed like an age to reach the summit plateau . . .
Was it going to be a steep pull up so soon after lunch ? Wind Gap . 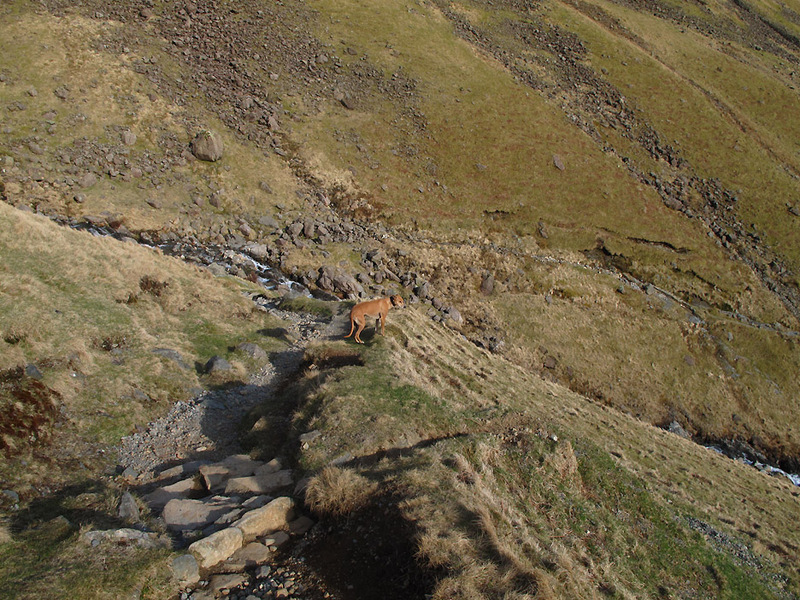 . . and the start of the steep scree path down, which can be seen to the left, highlighted by the exposed red earth. It was a steep climb but a really nice simple ascent, hands touching the rock at times to classify it as a simple scramble. 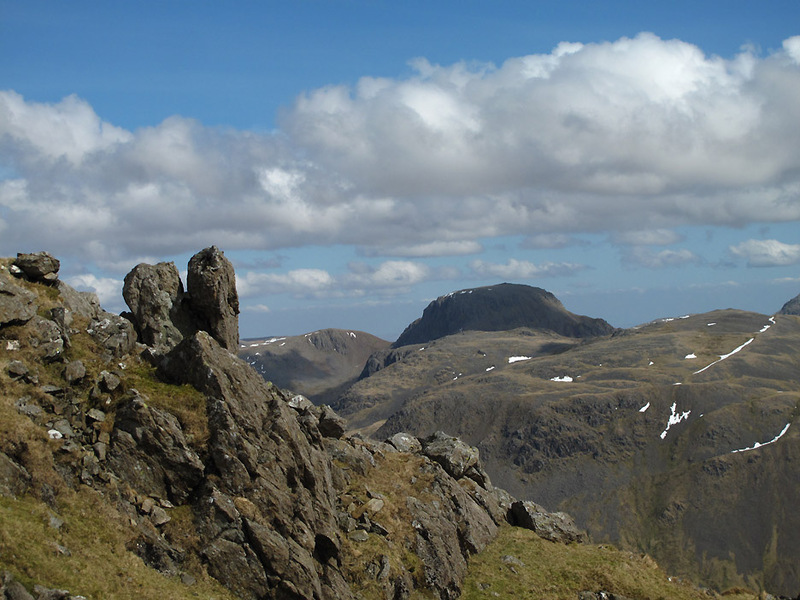 More great rock scenery as we look over to the dark 'gable' of Great Gable. 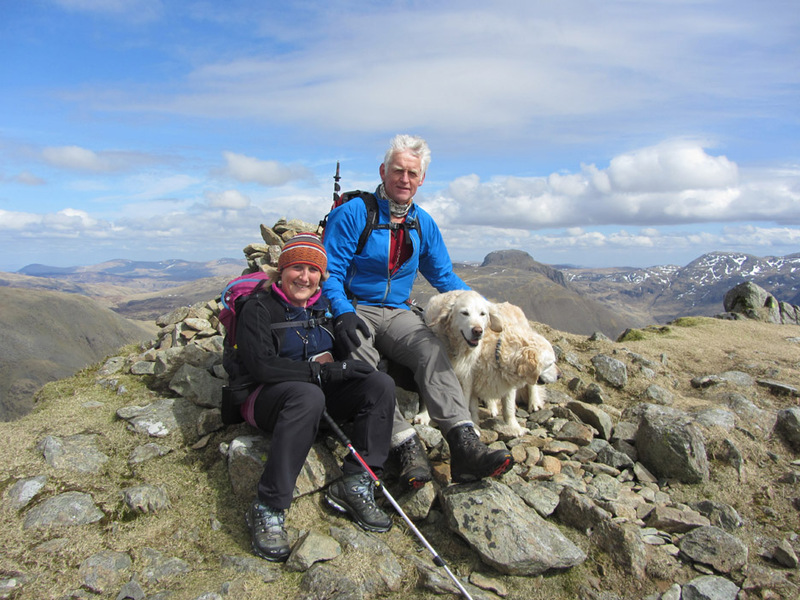 Beautiful sunshine now as we reach the summit of Pillar on this wonderful walking day. The two girls hang back at the trig point as I try and capture the mood of the moment. 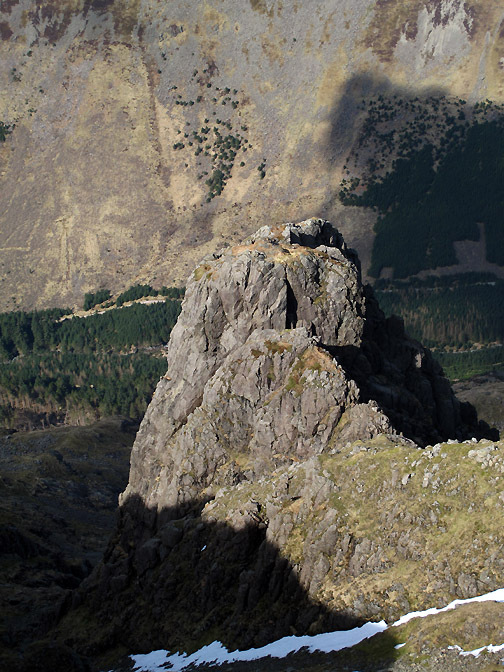 A short diversion to view Pillar Rock from above. that has set foot on its summit. 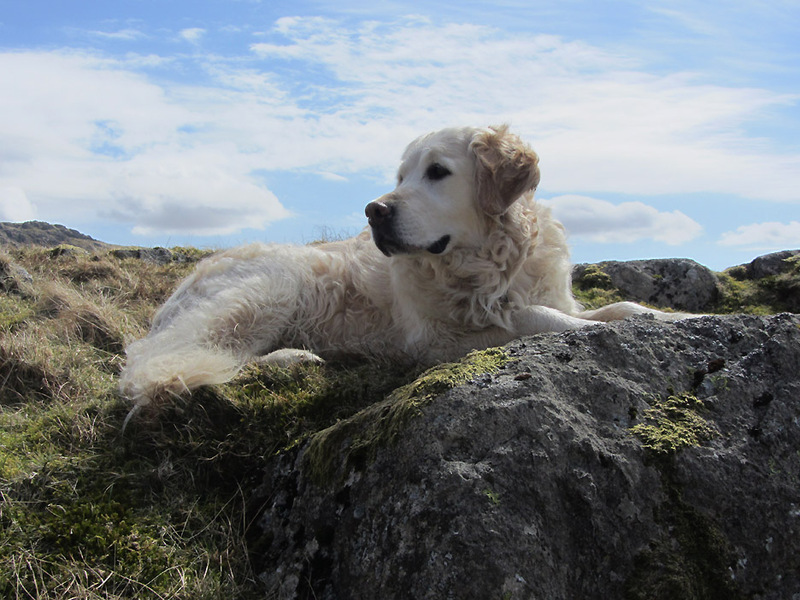 led her on a climb onto Pillar Rock. 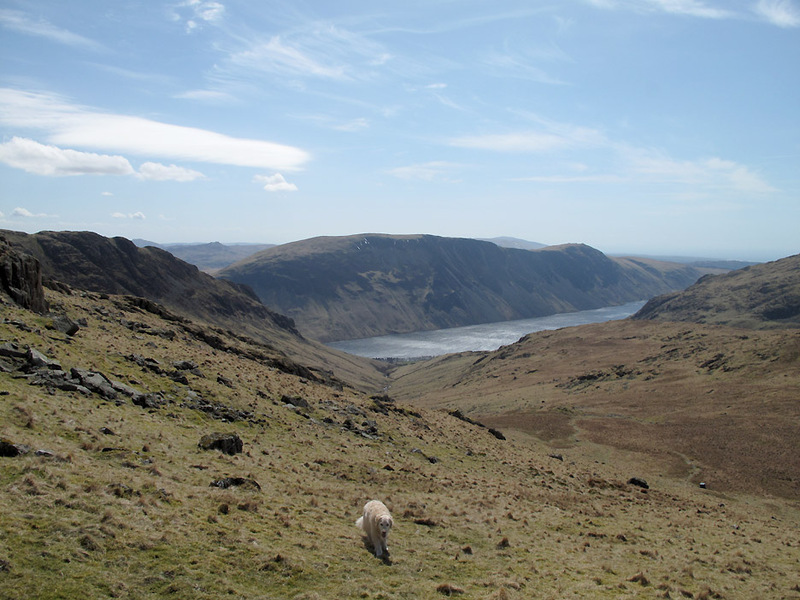 to the Buttermere fells of Robinson, Hindscarth and Dale Head . . . and finally over to Skiddaw and Blencathra in the distance. 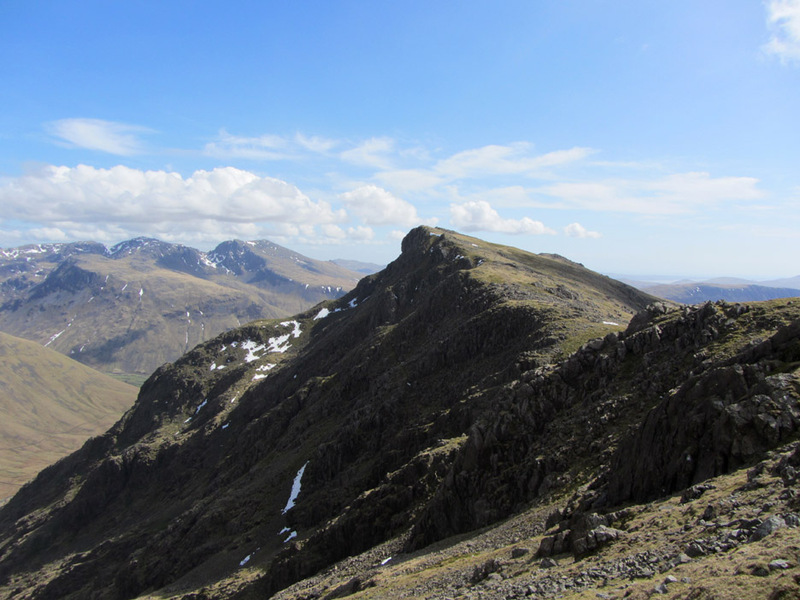 the High Seat/High Tove ridge . 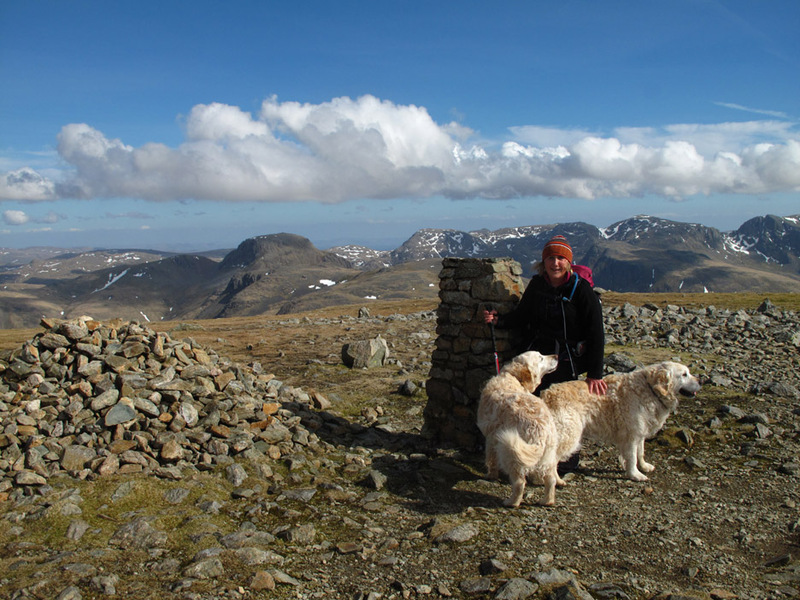 . . plus the Dodds and the Helvellyn ridge in the background this time. Moving on now as we drop down from Pillar towards Looking Stead. 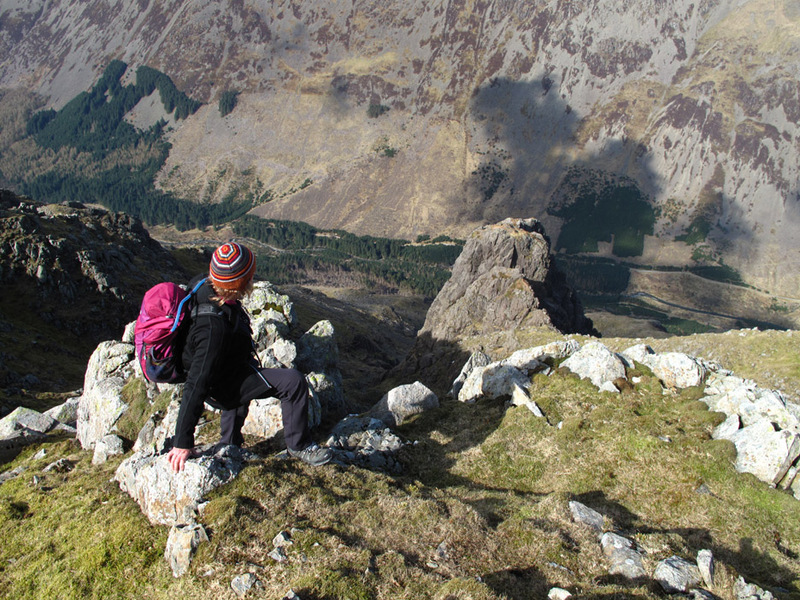 The views down into Ennerdale were superb from the edge of the crags. 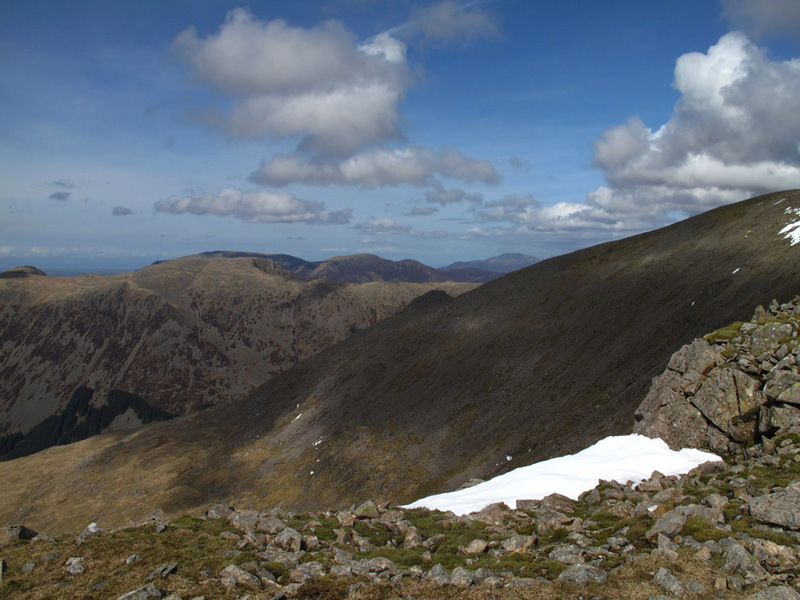 We had to walk up to the summit of Looking Stead to get our first view of Black Sail . 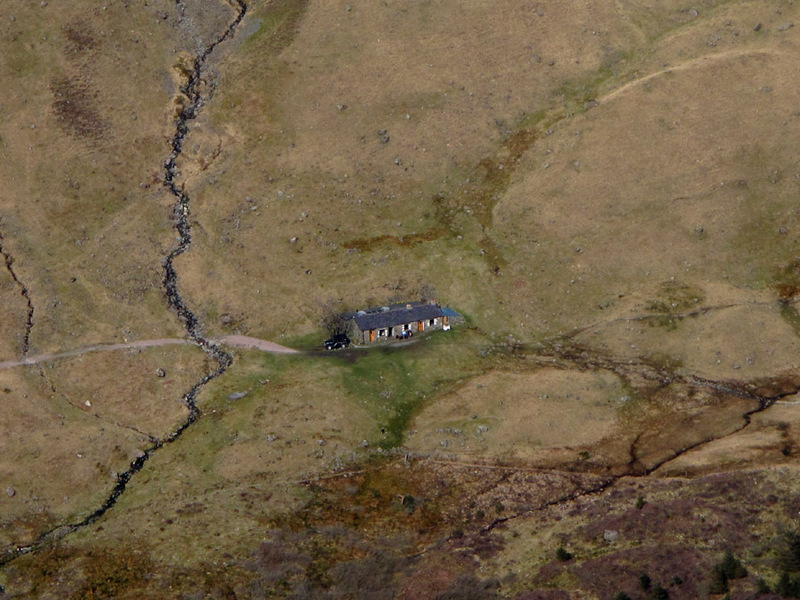 . .
the remote Youth Hostel at the head of the valley. Looking down on a view we have looked up at on many occasions in the past. There are plans to re-furbish the hostel and make it more warm and energy efficient. I'm not sure how far they have progressed. 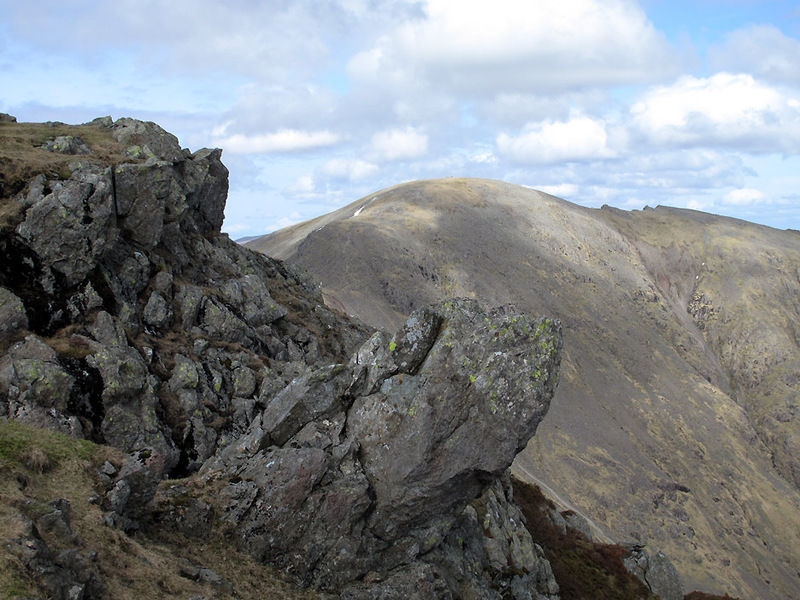 now that we are viewing it end-on instead of the broad side view we enjoyed from Red Pike. Follow the fence posts down . . . the fence wire having rusted away a long time ago. 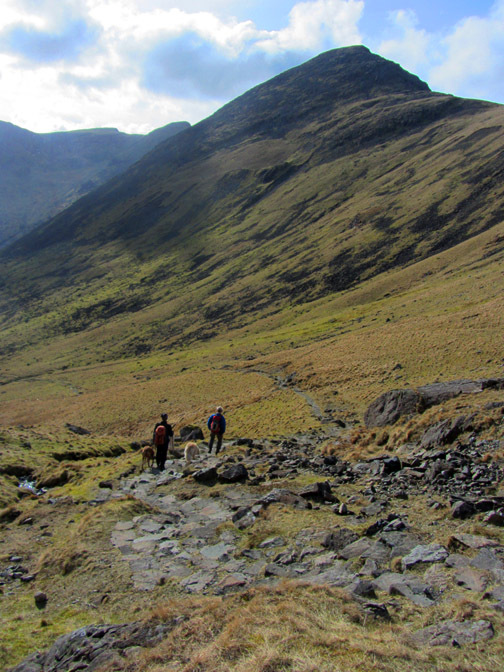 There is a short cut diagonally down but the start is a little indistinct so we headed for Black Sail Pass. and, in the ripples, the grey of the Kirk Fell crags beyond. 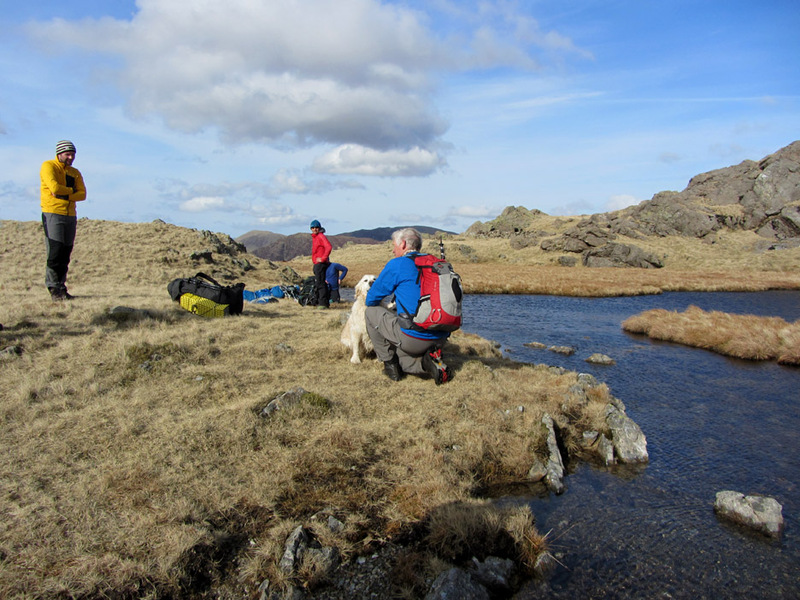 and had stopped to replenish their water from the tarn (using a water filter system) to top up their bottles. We (i.e. the dogs) were recognised by Alex who hails from Preston, and a photo records the occasion. Thanks for saying hello and for your subsequent email . . . regards to Dad who is also an avid viewer of Loweswatercam. leaving the lads to decide where to camp . 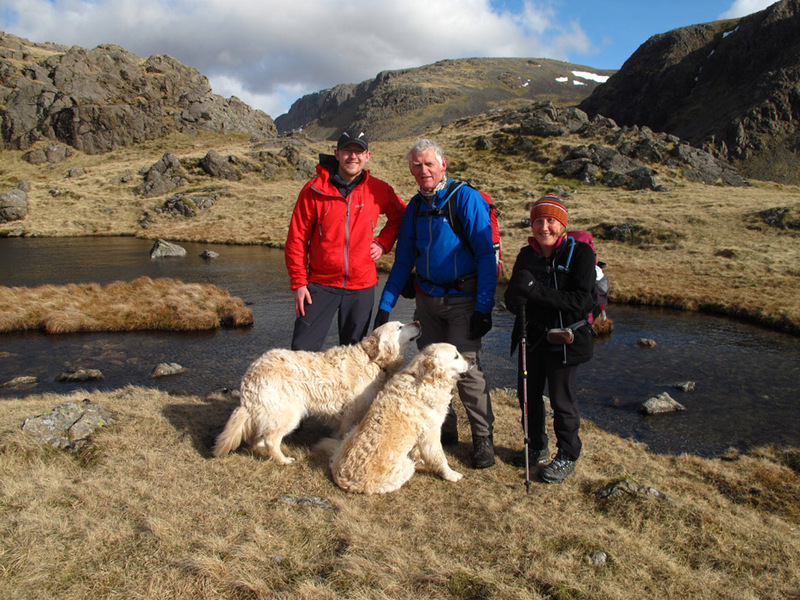 . . by the tarns, nearer the summit or over by the remote Scoat Tarn . . . for their overnight stay. 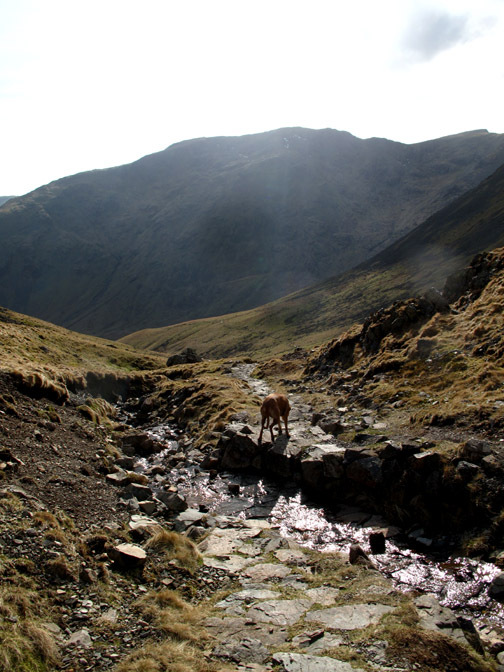 We join the pitched path down from the cairn . . .
. . . following the beck down into the Mosedale Valley. Two thirds of the way down the path turns a sharp corner and cuts across the stream. No bridge here . . . just a simple crossing of the stones that have gathered in Gatherstone Beck. Down at Valley level now and into the shadow of the high fells. 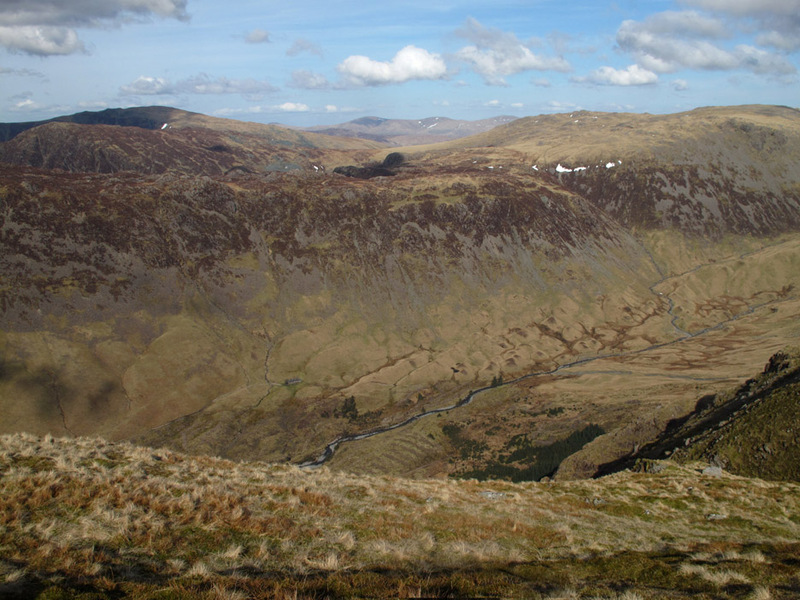 Wind Gap at the head of the valley can be seen above the grey scree in the centre of the picture. 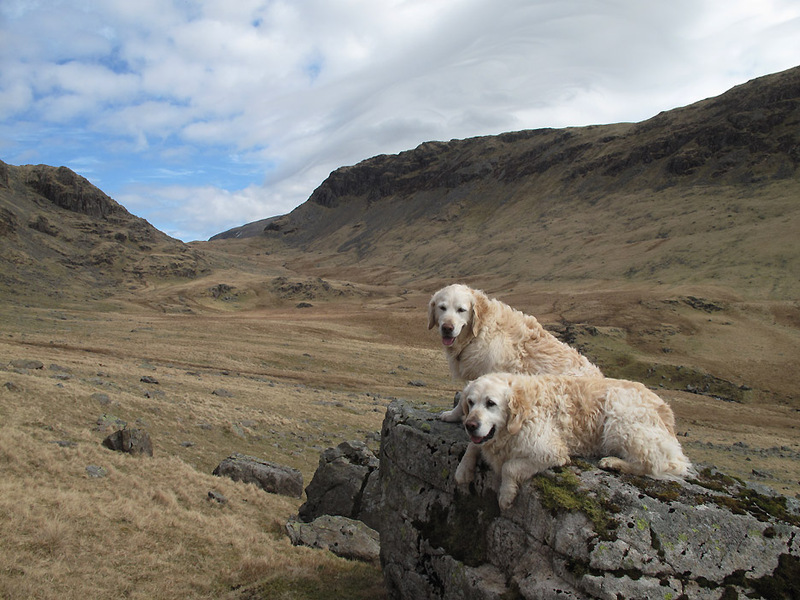 Here Yewbarrow towers high above us. 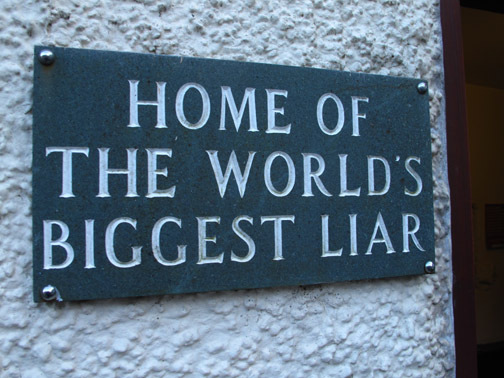 a place to be avoided if you can. It is a really tough ascent / descent route. in a way similar to ours. Others are camping out tonight too. 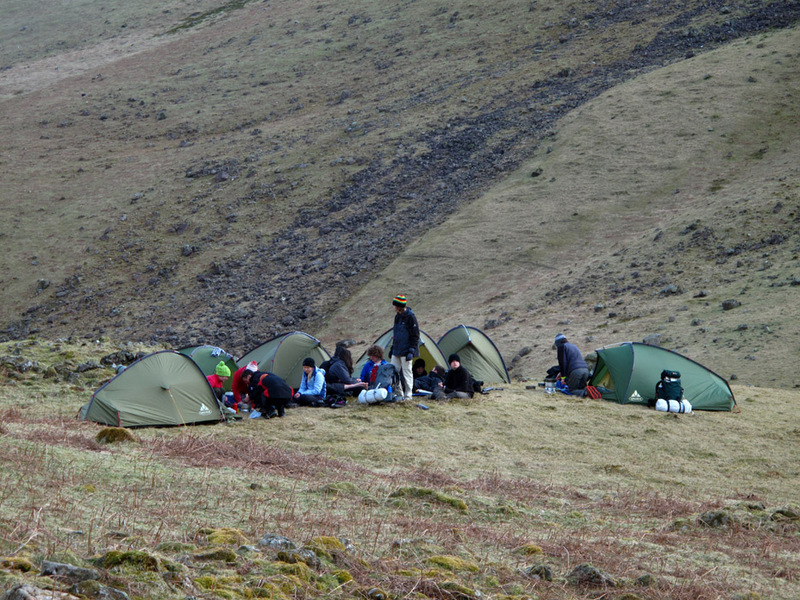 This Duke of Edinburgh party (we presume) is getting ready for a night 'under canvas'. 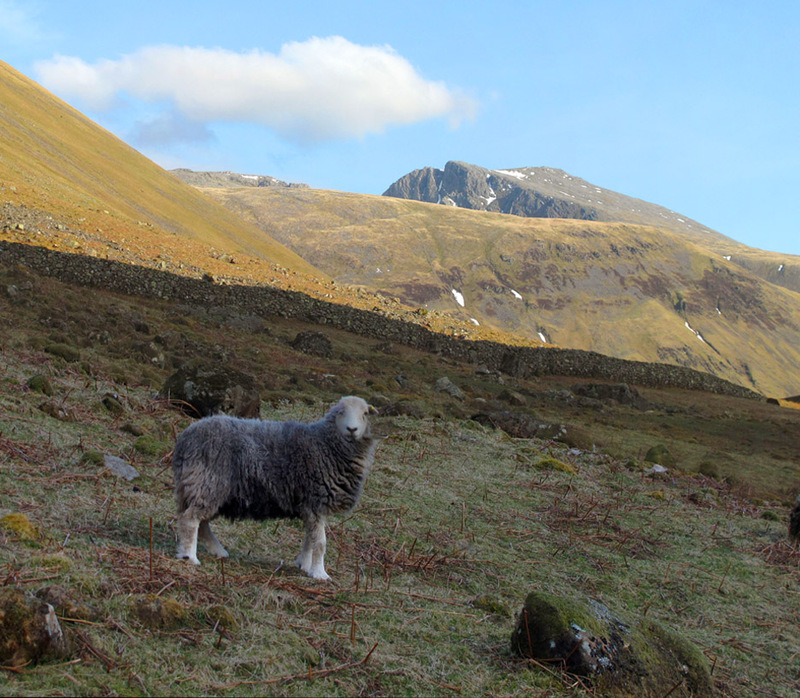 Still the weather is still excellent now and they, ouirselves and the Herdwick enjoy excellent evening light on the fells around. Here's a thought . . . are sheep able to enjoy the view ? Our dogs do . . . but sheep have never expressed any great opinion to us. 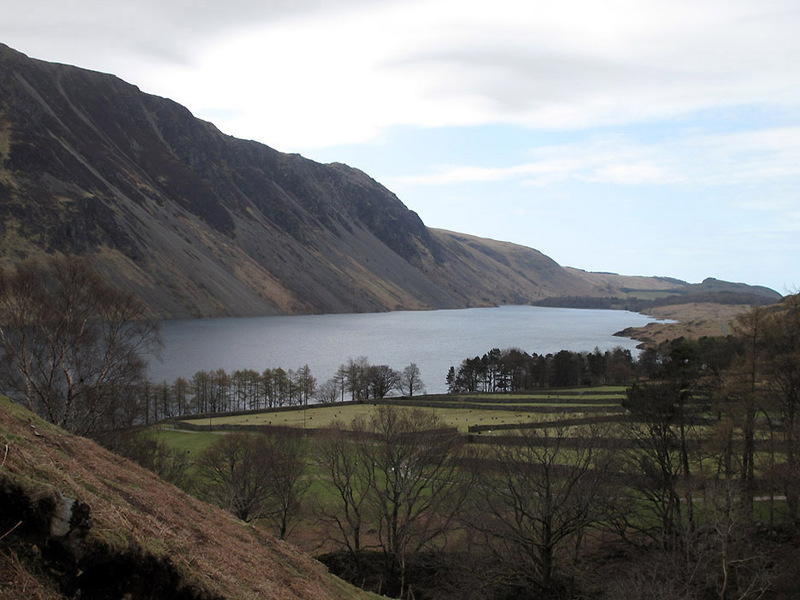 The final leg of the journey now as we reach the buildings at Wasdale Head. One last gate down into the valley . . .
. . . now closed behind us. 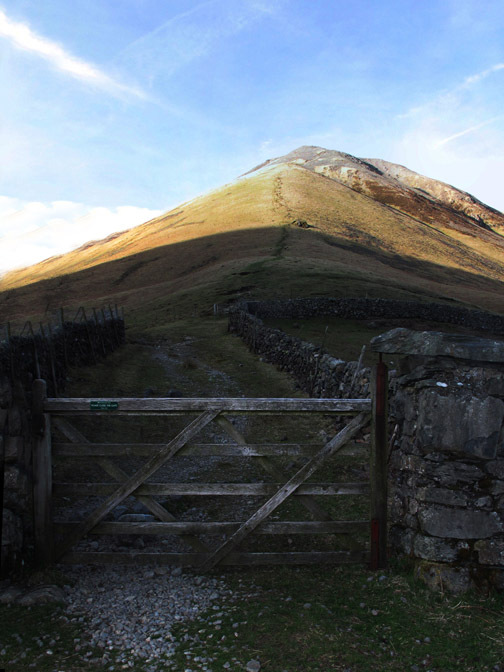 The direct ascent of Kirk Fell is beyond the gate . . . but that summit whiteness is an over-exposure, an optical illusion of the camera, not snow ! The pack horse bridge alongside the farm. I crossed over just for the picture and crossed back for the pub ! Home of early Rock Climbing . 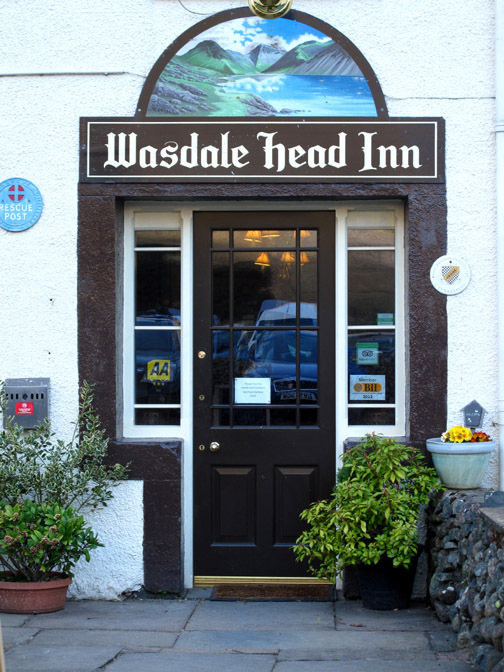 . . the Wasdale Head Inn. 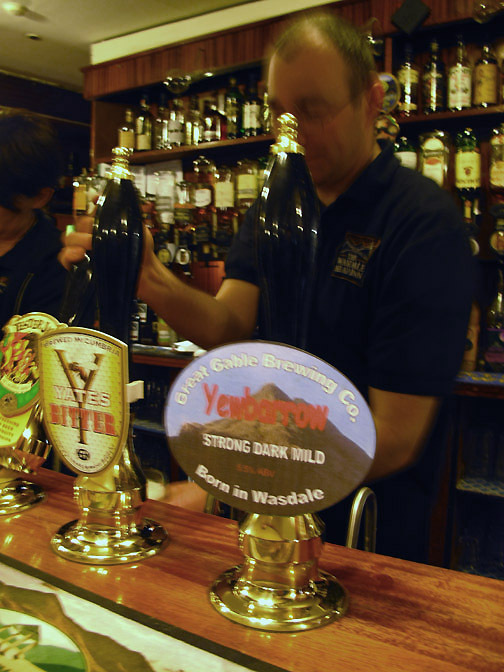 Home of Wasdale Beers . 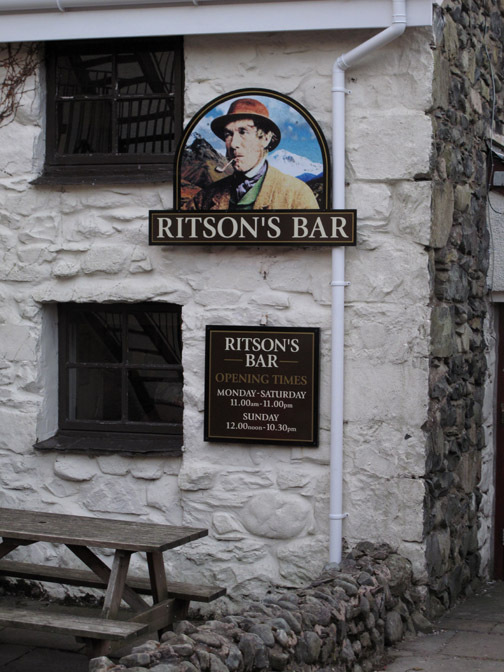 . . Ritson's Bar. In through the door to the timeless interior of the bar . 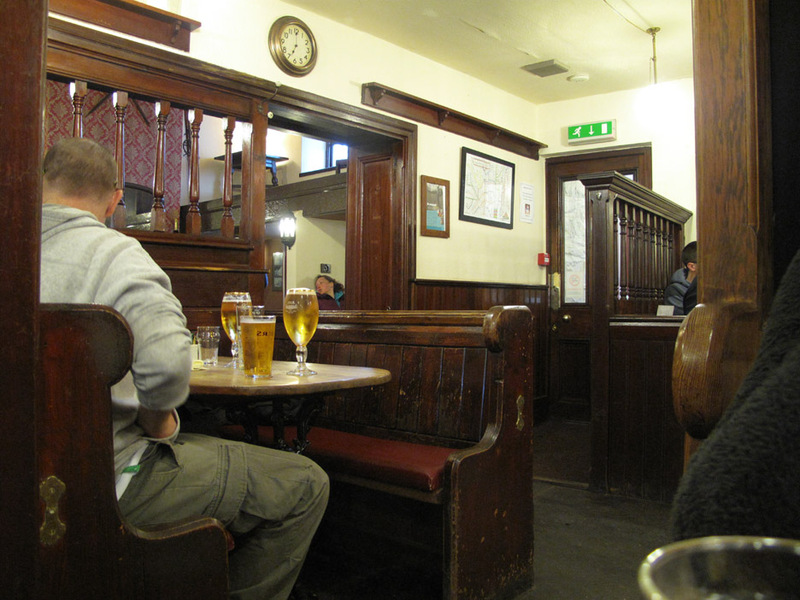 . . known and frequented by the many visitors to the valley. Mmm . . . a pint of that will be fine. I blame it on the low light not the alcohol. You believe what you want when you venture in here ! 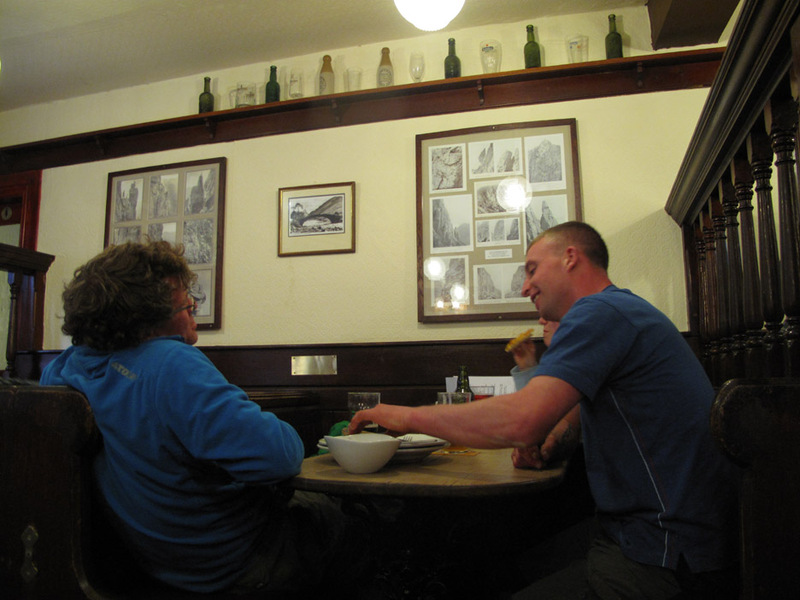 A place to chill our and relax after a good day on the fells. Time to be off . . . back to the car and home. Time for Jo to pick up Jodie after her long day in the house so no meal out tonight. This site best viewed with . 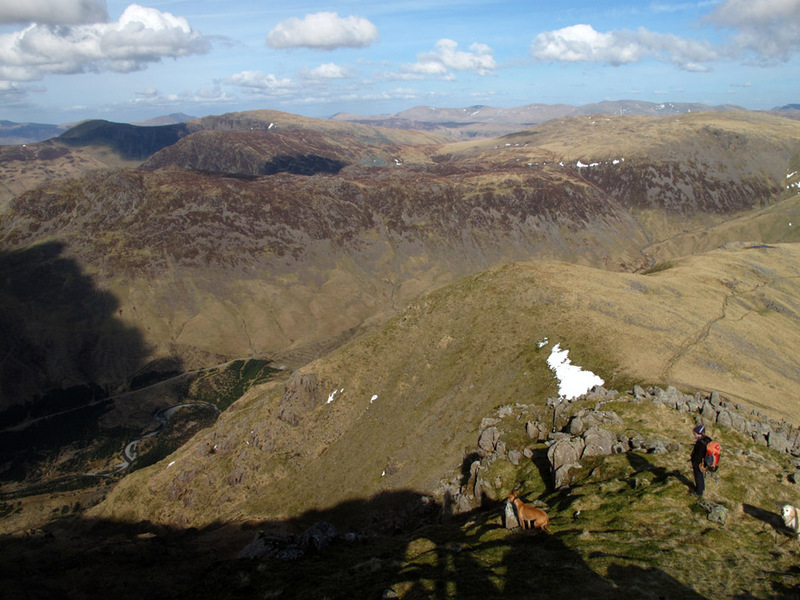 . . lunch on a high fell.